Senran Kagura: Peach Beach Splash is an unusual instalment in Senran Kagura series, being a third-person shooter where ranged combat with water weapons replaces the traditional hack-and-slash gameplay of previous titles. The titular Peach Beach Splash (PBS for brevity, not related in any way to the Public Broadcasting Service) is an ancient tradition where female ninjas engage one another using water weapons, and fight for the top spot that guarantees the winners anything their hearts desire. Each of the characters from Hanzō, Gessen, Hebijo and Crimson Squad participate in the tournament for their own reasons, whether it be for their friends’ sake, to ascertain their futures or simply prove their worth. As players progress through the game, they unlock various cards that bolster their characters’ abilities, as well as earn in-game currency that can be used to purchase character customisations. 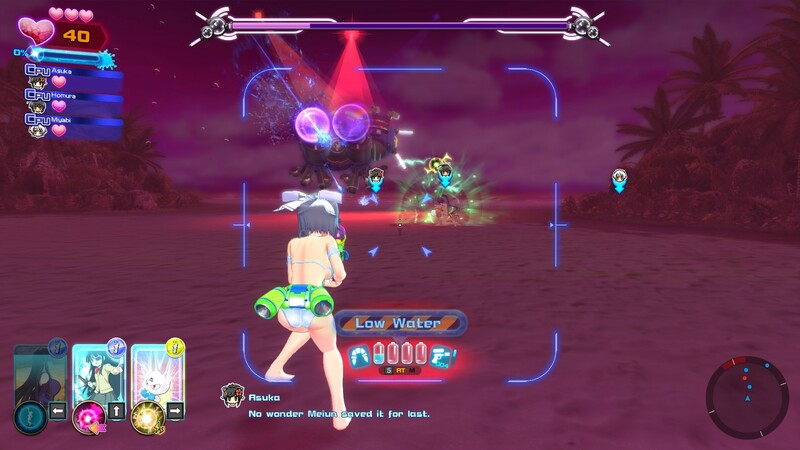 Mechanically, Peach Beach Splash is a reasonably solid title that features highly colourful settings, an unexpectedly engaging story that allows even newcomers like myself to gain a modicum of insight into what the characters are like, respectable shooting mechanics and above all, a progression system that encourages replay. The features available in Peach Beach Splash indicate a game where the core mechanics are well-defined, sufficiently to the extent that other Triple-A developers could stand to adopt a thing or two from Peach Beach Splash. One such title is DICE’s Battlefield V, which has proven to be a disappointment of late for its relative lack of content. While I appreciate that DICE has invested considerable efforts into improving gameplay mechanics, and for having introduced the Tides of War, which encouraged me to return weekly, the lack of maps has been put a dampener on my excitement. Further to this, the customisation system, originally touted as being an integral part of the experience, has been remarkably lacklustre. Peach Beach Splash offers a customisation system that puts Battlefield to shame once a day and twice on Sundays. Players have access to an impressive collection of clothing options right out of the gate and can customise their characters to some extent even before they start the game, and as in-game currency is earned, more options become available. Moreover, clothing in Peach Beach Splash reacts to water effects properly. By comparison, one could swim through a river in Battlefield V and come out as dry as they’d been sitting by a roaring fire for a few hours. From a Triple-A title powered by one of the most advanced game engines known to mankind, this is disappointing: I expect more realistic visuals. The cosmetics system in Peach Beach Splash is sufficiently versatile such that the combination of choices is nearly limitless, and players can precisely tune their character’s appearance prior to setting foot on the battlefield. Besides a deep cosmetics system, Peach Beach Splash also outdoes Battlefield V in terms of its map count. Battlefield V launched with a measly eight maps, and in December, Panzerstorm was introduced, bringing the total to nine. Peach Beach Splash has a total of eighteen maps, bringing additional variety into the base game. DICE could take a leaf from Peach Beach Splash: maps are the core of the Battlefield experience, and a part of what makes Battlefield so appealing is being able to learn the ins and outs of each map over time. Greater map diversity keeps the game fresh, and Peach Beach Splash already nails this. Between the superior map variety and customisation system, Peach Beach Splash‘s developers have evidently gone the lengths to make sure that, even without a live service model, their title remains serviceable. DICE could certainly stand to look at games elsewhere for inspiration on what Battlefield V requires to be a long-lived, successful title in the long run. I’ll open by mentioning that I’ve got no familiarity with any of the characters of Senran Kagura: I started the game with Yumi, a third year of the Gessen Academy who is said to be cool as ice, but underneath a rigid exterior, is someone who cares for her friends to a great extent. Unlike the main games, all of the characters handle the same, and the choice of character is purely a cosmetic one. 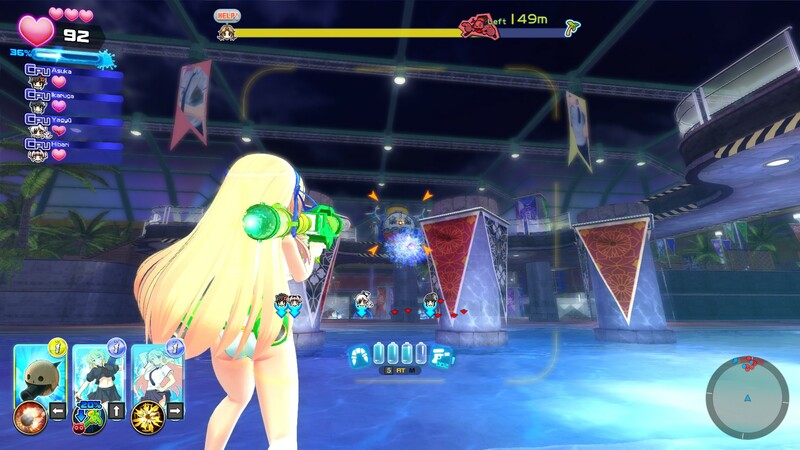 Swimsuits, water parks and blue skies are classic summer settings: it is therefore a bit of irony that I played through Peach Beach Splash during the Christmas season. Having bought this on the spur of the moment while I was picking up Valkyria Chronicles 4, I felt that this game would offer simple and frivolous fun, far removed from the more demanding nature of titles like Battlefield V. For one, Battlefield V does not provide players with aesthetically pleasing characters to look at. If I had to be truthful, Peach Beach Splash has unresponsive, slow controls unseeming of a shooter – this is offset by an automatic lock-on system. In the end, while a third-person shooter, Peach Beach Splash lacks the mechanics that most demand skillful aiming, and instead, places more emphasis on cooldown management, which requires a different set of skills. The weapon selection in Peach Beach Splash is basic but sufficiently diverse. The assault rifle-type water gun that is good for medium and close ranges, striking a balance between reload speed and damage output. The water pistol handles like a hand cannon, dealing high damage at the expense of firing rate, while dual pistols allow for a higher capacity in exchange for damage output. There’s a slow-firing rocket launcher that does ranged area-of-effect damage, a water-balloon launcher with limited range but area-of-effect impact, a sniper rifle for precision shots at range and a shotgun that excels in close quarters. More outrageous weapons include a Gatling-gun that has a long reload time but is unparalleled in damage output and a portable hose that handles like a flame thrower. Like Battlefield 4, the assault rifle is more than adequate for most missions. A player’s ammunition reserves is shared with their jump packs, which propel players forward or up. It’s a fun way of getting around quickly and brings to mind the jump packs of Titanfall, even if wall-running is not a feature in Peach Beach Splash. For the main campaign, I ended up playing with a variety of characters, and here, square off against one of the machinations that PBS’ hosts bring to bear. The boss fights were quite ludicrous, being a world apart from the deadly-serious bosses that were seen in The Division. While I’m wielding a rocket launcher here, there’s more than one way to beat a boss – provided one doesn’t pick the close quarters weapons like the hose or shotgun, bosses will go down with enough patience. Some of the characters in Senran Kagura have troubled pasts: Murasaki here is a gloomy, pessimistic character who wields a terrifying power causing her to black out and enter a berserker rage when angered or cornered. She’s normally quiet and soft-spoken, and in Peach Beach Splash, wields none of her usual powers. While Peach Beach Splash might have simple mechanics, the voice acting is on-point and brings the characters to life. I was particularly fond of the different stories each of the characters for the different groups had, and this gave a bit more reason to be rooting for each team as they progressed through the tournament. With a boisterous personality, Homura leads the Crimson Squad, who in Peach Beach Splash, is desperate for work following their departure from Hebijō, and since then, have scratched a living off rocks. While this is more serious in the series proper, Peach Beach Splash has them attempt various money-making schemes, such as comedy skits and the like; the PBS tournament represents a chance to become famous and earn some hard currency for Homura and her team. I rather disliked the missions where an accident results in fires being spread around a map: there’s no indicator on the minimap as to where the fires actually are, and finding them can be tricky, if they’re hidden behind other objects. These missions tested my patience more than any other part of Peach Beach Splash, and I elected to roll with the pistol, which has the smallest profile of any weapon and would also allow me to use my jump pack more liberally. The inability to aim means that boss fights are trickier than they would in other games: in The Division, for instance, I have very fine control over where my character is shooting and therefore, I can always flank a named elite, using my skills to distract them if necessary, and then getting a good flank off, allowing me to target their weak points. This simply isn’t viable in Peach Beach Splash, but I suppose that having superior clothing-water interactions does make up for this to an extent. Besides fights against swarms of weak enemies, Peach Beach Splash also gives players a chance to square off against characters from the other schools. Enemy characters are more durable and will project a shield if their health drops below a certain point, and once they are vanquished, can be finished off by means of glory kills: while not quite as visceral as the glory kills of DOOM, it’s still entertaining to take aim and blast their enemies into humiliation. While body shots are technically possible, having played shooters for a nontrivial period of time, I always go for the head. As I progress further into Peach Beach Splash, I developed my own set of favourite characters to fight with. Murakumo is my current favourite – one of the Gessen students, she hides behind a mask the same way Gundam Unicorn‘s Full Frontal does, assuming the veneer of a terrifying warrior. This belies a shy, insecure personality prone to speaking with a squeaky stutter. Her time at Gessen and with Yumi helps her improve, and I roll Murakumo without her mask for most. Most of Peach Beach Splash‘s campaign missions focus on the schools, but once all of the schools and Crimson Squad’s stories are completed, players gain access to additional missions that showcase other characters. These additional missions are a pleasant surprise and also expose the fact that the PBS Tournament is not all that it appears. The campaign is a bit corny, but all the more entertaining for it. Besides the campaign, there’s also a series of side stories, plus the option to mess with the characters in what Peach Beach Splash refers to as the locker room. I’ve begun customising my preferred characters here, and while I don’t think I’ll ever use the locker room’s more unnecessary (for me) functions, it remains an option for the folks who might have use for such faculties. I have no objection to such features, although it appears that not everyone shares this particular perspective. I’ve heard that Kenichiro Takaki, Senran Kagura‘s main producer, left Marvelous for Cygames after Sony imposed restrictions on the content that is permissible within PlayStation games. Feeling that Senran Kagura would be diminished, Takaki decided to work with a company that would not be subject to the same constraints. These restrictions come from the North American branch of Sony, and sets a worrying precedence for future developers in that North American values, particularly those of the United States, could be used to force overseas developers to comply to arbitrary demands. I personally feel that it is definitely not the place of North Americans to influence decisions that affect organisations abroad, least of all from individuals who have no interest in the game – there is such a thing is not playing what one doesn’t like, after all. It is unfortunate that those who would seek to deprive others of their preferred entertainment exist. It is beyond the scope of my understanding as to why some would do this, and also beyond the scope of this discussion. Over the course of Peach Beach Splash, I’ve been slowly upgrading all of my weapon cards: like The Division, I rarely use the card abilities for skills, instead, placing faith in my choice of weapons and a sure aim. As the end of the game draws nearer, I field Yumi again, and invite readers to take a gander at her profile at the Senran Kagura wiki, which has a rather…interesting description of her physical attributes. The final boss of Peach Beach Splash‘s campaign is a massive entertainment system that shoots lasers. My computer-controlled allies were next to useless in this and were promptly melted. It took me a few attempts to beat this monstrosity, whose attacks, while predictable, are powerful and whose biggest asset is a deep health pool that puts even the Black Tusks’ named elites to shame. I ended up winning by retreating to reload and hammering the mobile entertainment system with the water that I had. Eventually, I’d worn down its health enough, got to the bottom of what was keeping the girls on the island and ended the campaign. My skills from The Division far exceeded what was necessary to do well in this game, and having beat the game, there is the matter of whether or not there I may give other Senran Kagura games a spin. The answer to this is that only time will tell. I imagine that, were the DICE team to take a leaf from Tamsoft and focus on creating a solid experience for players, Battlefield V could yet be salvaged; Peach Beach Splash represents a polished, smooth product designed with the players in mind. A Battlefield title with more elements inspired by Peach Beach Splash would certainly make a splash, and…I think that’s about as far as I can take this year’s April Fool’s joke. In actuality, while I am quite disappointed with the lack of maps in Battlefield V, the mechanics have seen substantial improvement, and I’ve been having fun with the Tides of War, scored an 18-streak and found Rush to be a welcome game mode. It is the case that I wish DICE would focus on creating new maps and exploring new theatres rather than divert efforts towards minor game modes, but the reality is that I’m not terribly worried about the cosmetics system. The new Firestorm mode has also been a welcome addition: I was hesitant about it until trying it out, and overall, Battlefield V isn’t terrible: it is true that I am bored with the lack of maps, but there’s plenty of other games to go through while I wait for the new maps, which are slated to arrive in May. With this in mind, Senran Kagura: Peach Beach Splash was something I got during the winter holidays as a bit of a joke. 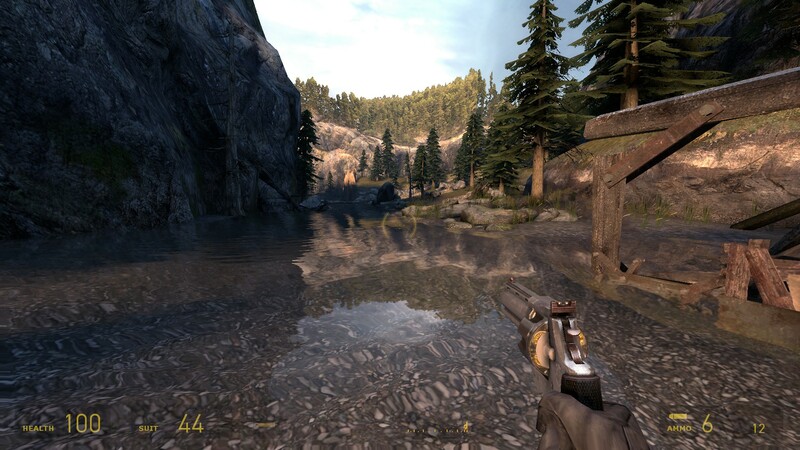 The gameplay is a bit wooden, and somewhat uninspired – aiming takes no skill. With this in mind, I was impressed with the movement system, and extent of customisations available to players in Peach Beach Splash. As well, the character stories did give the game additional depth that I was not expecting: Peach Beach Splash is intended to tie the different schools together, and while I’m not too familiar with the Senran Kagura lore, it is clear that each character has their own story and goals. The main games go much more deeply into the world that is Senran Kagura, but having a bit of story in Peach Beach Splash did much to liven up what is ultimately a fanservice game with no aim beyond showcasing a visually-pleasing cast in swimsuits. It’s certainly not a match for something like Battlefield V, but as far as providing some laughs go, Peach Beach Splash does deliver. Earlier in November, Activision and Bungie made their RPG-shooter, Destiny 2, free of charge for all players with a Battle.net account. Bungie’s project following Halo, Destiny and Destiny 2 is set in a future where humans began colonising the solar system and underwent nearly seven centuries of technological advancement brought on by the arrival of a mysterious entity known as the Traveller. This period became known as the Golden Age, although it was brought to a halt by the Collapse, which annihilated human colonies. Players take on the role of a Guardian, whose powers come from the Traveller’s Light duty is to save the Traveller and answer the threat of other aliens. 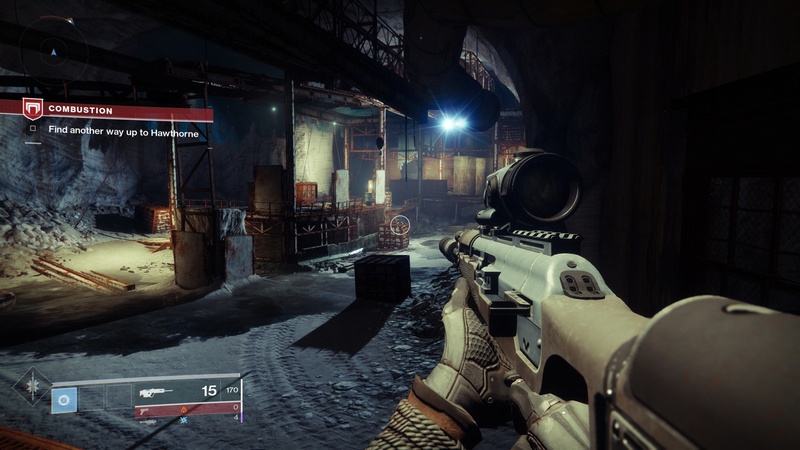 In the original Destiny, players deal with the Vex, semi-organic androids. By the events of Destiny 2, the Cabal forces of the Red Legion, lead by Dominus Ghaul, assault the Last City and drain the Traveller of its Light. 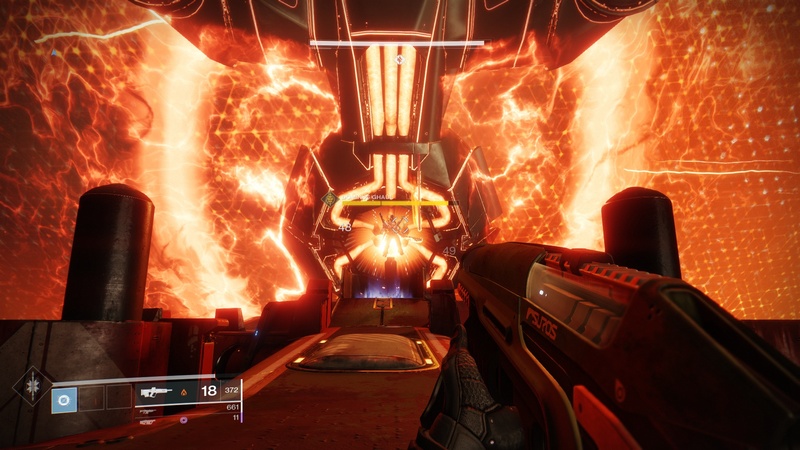 Players retrieve a shard of the Traveller to restore their Light, then travel to Titan to repel the Hive and rescue Commander Zavala, who reveals that the Cabal have a superweapon, The Almighty, that can incinerate suns. The Red Legion was sent to the Milky Way two years earleir, and Ghaul had overthrown the Cabal Emperor, planning to take control and use the Light to consolidate his rule. The player then makes their way to Nessus to find Cayde-6, who will be instrumental in taking back the Last City. Ikora Rey is on Io, and after all of the key individuals are present, the player is sent to destroy the Almighty. 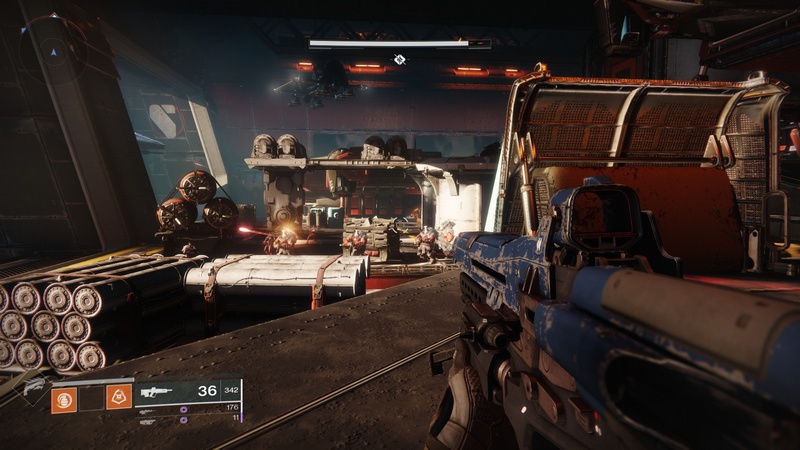 Returning to the Last City, players confront Ghaul and defeat him in battle. 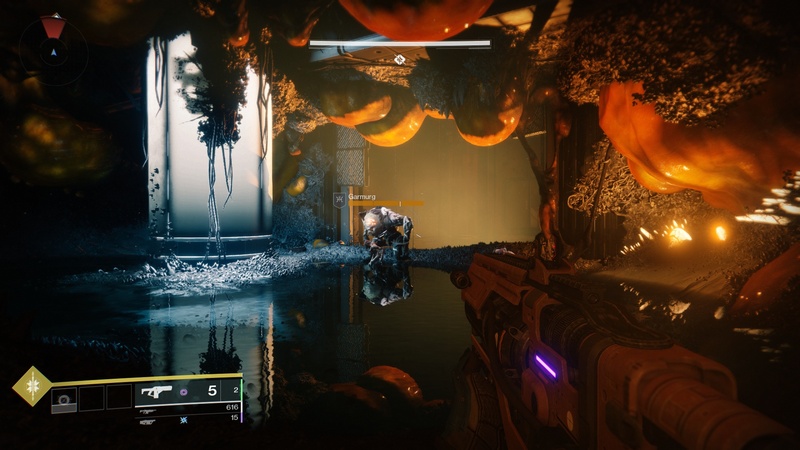 Ghaul attempts to manifest as an ethereal being, but the Traveller reawakens and kills Ghaul. This is where my time in Destiny 2 ends; after the campaign, Cabal vessels appear under exiled Emperor Calus’ command, and Destiny 2‘s endgame begins. Like The Division, Destiny 2 is ultimately about collecting awesome gear and constantly levelling up one’s power level, similarly to how one can bring their Gear Score in The Division up to its cap. 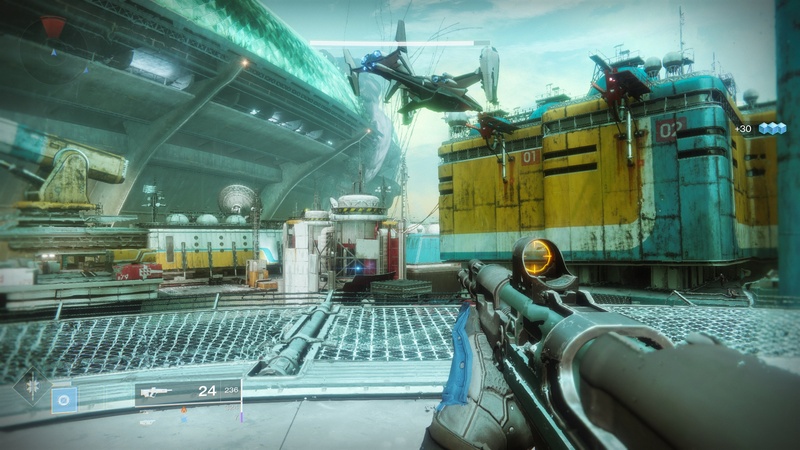 The core enjoyment I’ve gotten from playing through Destiny 2 was being able to experience a very Halo-like game on the PC: ever since Bungie decided to shift their focus, the iterations of Halo past Halo 2 never made it to PC. Thus, when it was announced that Destiny 2 wuold be complimentary on PC, my interest was piqued. 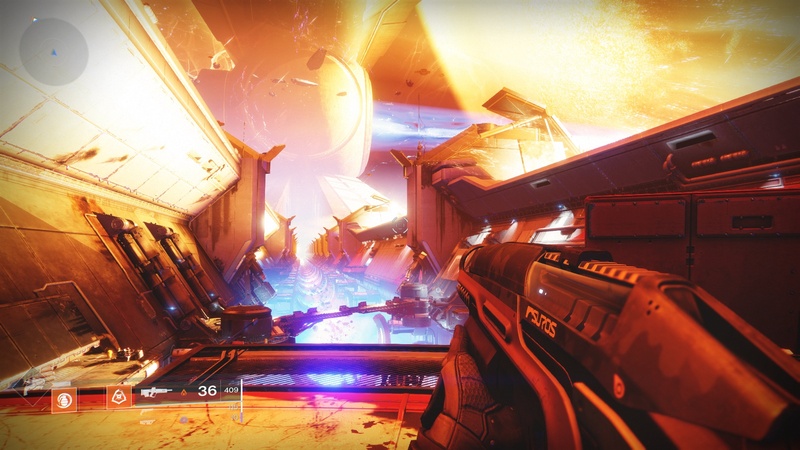 The game is a hefty 80 GB to download, and I encountered some installation problems, but once Destiny 2 was set up, I was blown away by the environments. 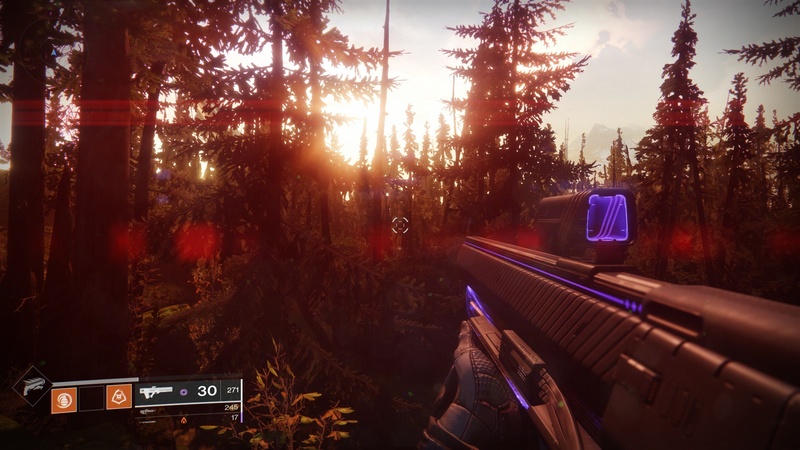 Destiny 2 is visually spectacular: during the first mission where I needed to fight off waves of Red Legion in the Last City, the scenery was stunning, and remained very expansive throughout the game’s outdoors segments. From the forests of Earth to the exotic looking environment in Nessus, Bungie has nailed the environments. 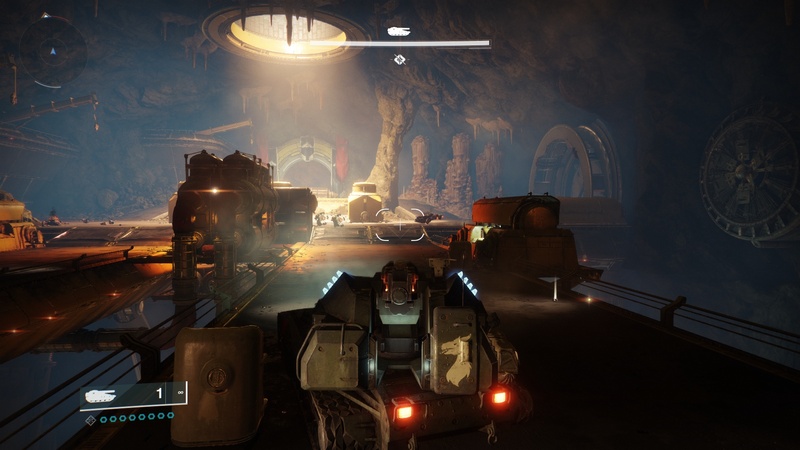 There are also many dungeon-like sections, as well, during which players must fight in narrow corridors and chambers deep underground, or in the bowels of a Cabal vessel. Destiny 2 itself is very similar to Halo, with the lore, gunplay and story to match: in particular, the Cabal themselves are familiar, resembling the Brutes of Halo. While there is no Master Chief or Halo Array, there is a Guardian with uncommon powers and a sun-destroying superweapon. 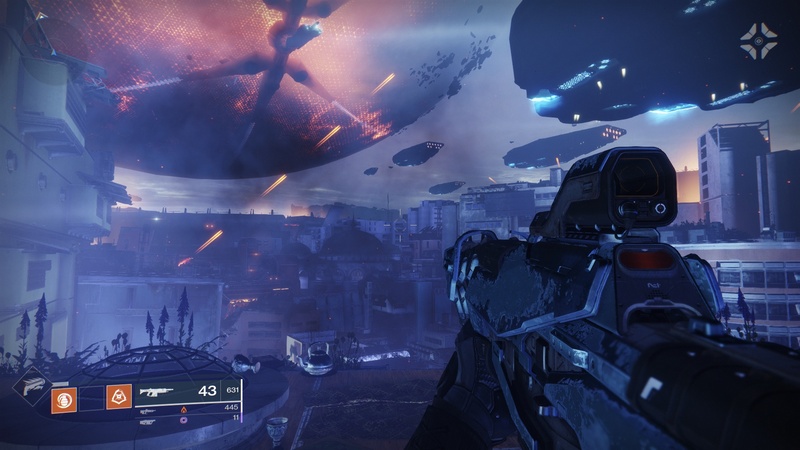 The scales of the environments and stakes are similarly high, in typical Bungie fashion. 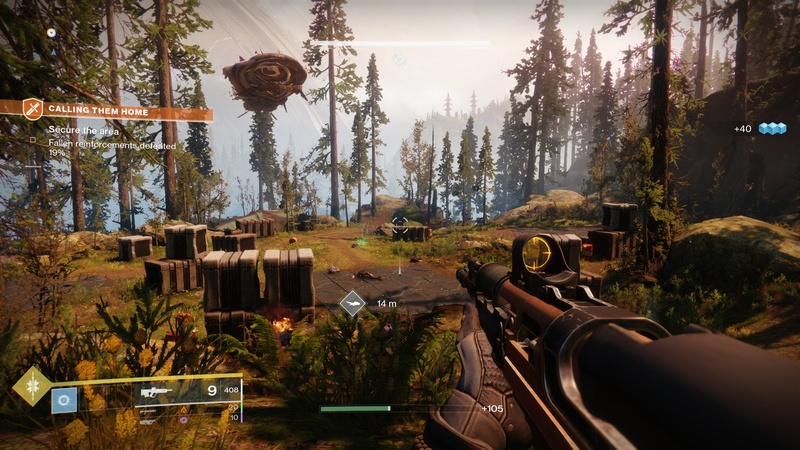 Destiny 2 is, in short, a spiritual successor to Halo on the PC platform, albeit one that encourages replay value through collecting powerful gear rather than attempting to unlock various medals in the multiplayer mode, and overall, it’s a rather enjoyable experience. The download for Destiny 2 was a massive 80 GB and took over two hours to download. 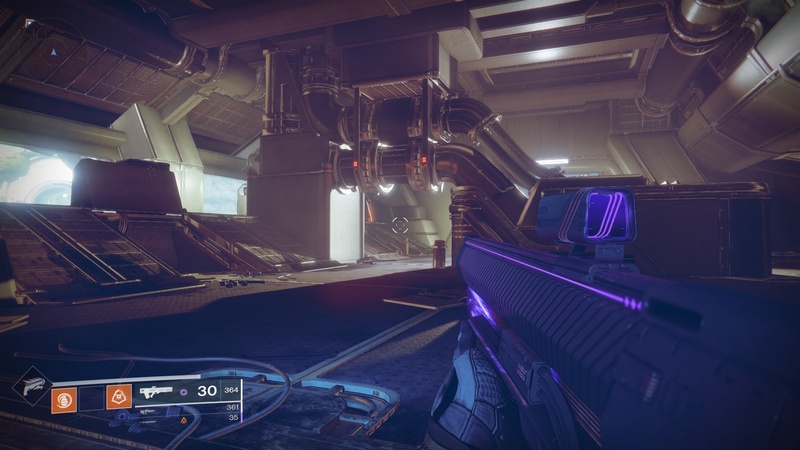 I was very surprised to learn that Destiny 2 was, from November 2 to 18, complimentary: Bungie was intended to promote their Forsaken expansion and as incentive for players to get into Foresaken, made the base game free for a period. Despite how busy things were, I decided that with a Triple-A title available, it would be worthwhile to at least pick the game up and give it a spin. My gaming desktop is five and a half years old now, and its age is showing somewhat. 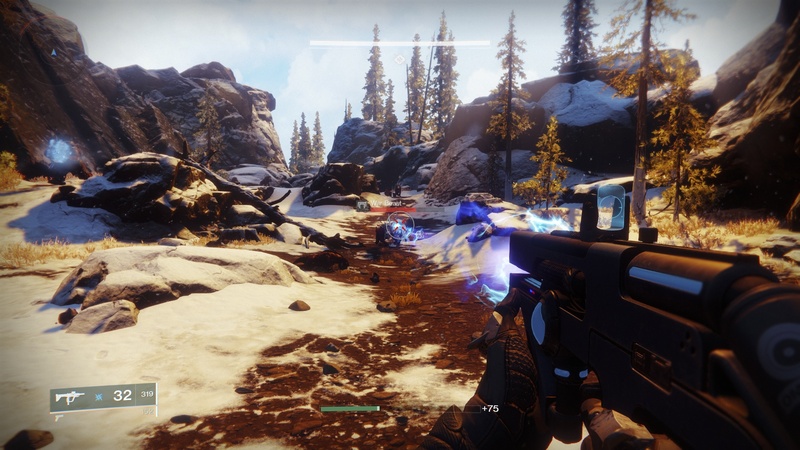 However, thanks to maintenance, and the fact that I upgraded the GPU a few years ago, it’s managing to hold its own, running Destiny 2 at a very smooth 60 FPS, and I encountered no difficulty in getting through the game. The first mission was breathtaking, seeing the player fight the hordes of Red Legion Cabal in the city with massive capital ships overhead. Unlike the Elites of Halo, who are honourable and build elegant, smooth structures, the Cabal are concerned with conquest and power. These massive aliens resemble the Brutes of Halo and are the main antagonists of Destiny 2, and their constructs are similarly utilitarian in nature, standing in contrast with the interiors of Covenant ships. The first mission ends with the player being stripped of their powers and near-death after Ghaul takes from the Traveller its Light. Staggering through the burning city, the player finds themselves out in the wilderness, with Ghost warning them that without the Light, death is permanent. The run through the wilderness with an SMG is set to Journey, an incredible song that captures the desperation and hopelessness of the situation now that the Light has gone from the player. It is rare that a song can evoke such a strong positive feeling in players, and universally, the soundtrack is counted as being one of the best in a video game: Michael Salvatori returns from Halo as one of the composers, and the music so incredibly enhances the atmospherics of Destiny 2 that it is difficult to imagine what the game would be like without it. While I was doing my hike at Grassi Lakes a week after picking up Destiny 2, the soundtrack came to my mind as I climbed up ice-covered trails along a frozen waterfall up to the lakes, and then again as I scrambled along a rocky hillside. The scope of the topics covered in this blog may imply its owner is quite inactive, but I spend a fair bit of my time with lifting, martial arts and walking around – hikes are reserved as special events primarily because of the fuel prices it takes to get out to the mountains. I believe in balance, and I exercise with the same frequency that I game. 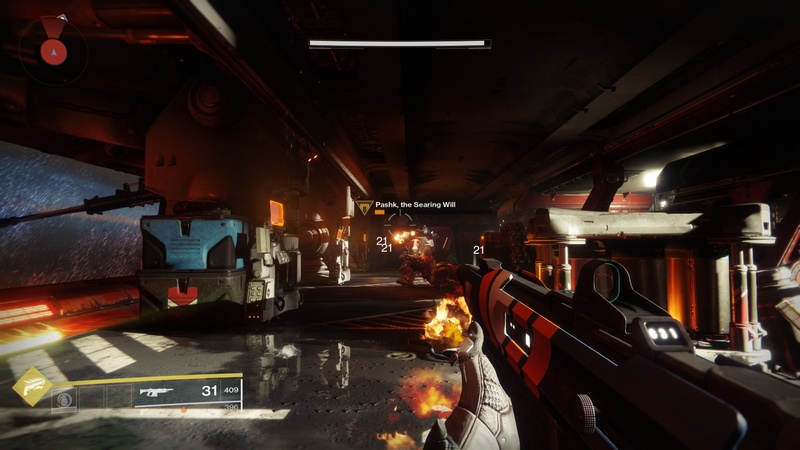 There are a great many underground, dungeon-like missions in Destiny 2: the opening and closing missions of the game are Destiny 2 at its finest, and the middle missions are very repetitive. By comparison, The Division‘s missions have enough diversity in their environments so that they are a bit more varied: overall, The Division‘s campaign is more fun, but Destiny 2 has more epic environments and music when the game does come through during its beginning and ending. Throughout most of Destiny 2, I ran primarily with a burst-fire rifle for my kinetic weapon: because of the way damage is dealt in Division 2, having an automatic rifle meant burning through ammunition very quickly. Ammunition drops very frequently, but I prefer the precise damage that burst-fire rifles deal against enemies: one or two bursts will drop any enemy provided one’s aim is true, and the weapon’s power level is sufficient. After a day of hiking, I returned home to prepare some vegetables ahead of a raclette party, then while waiting for the party to start, pushed further in Destiny 2. The occasional public event adds a bit of spice to the game, and it’s fun to join random other players in blasting the open world bosses that show up. Because I had not the time to do a campaign mission, I ended up doing some public events and a side mission prior to raclette. Despite a smaller turn out this time around, it was an excellent evening that saw the enjoyment of fondue, sausage, shrimps, raclette-style cheese-mushrooms-peppers-and-potatoes, all the while listening to hilariously bad music while waiting for the food to cook. Once we finished off most of the food, the party shifted downstairs to a card game. It’s been a while since I’ve been to a raclette, and these events are always fun. For the duration of the party, my worries evaporated, and I ate, drank and relaxed as I’d not done so for quite some time. 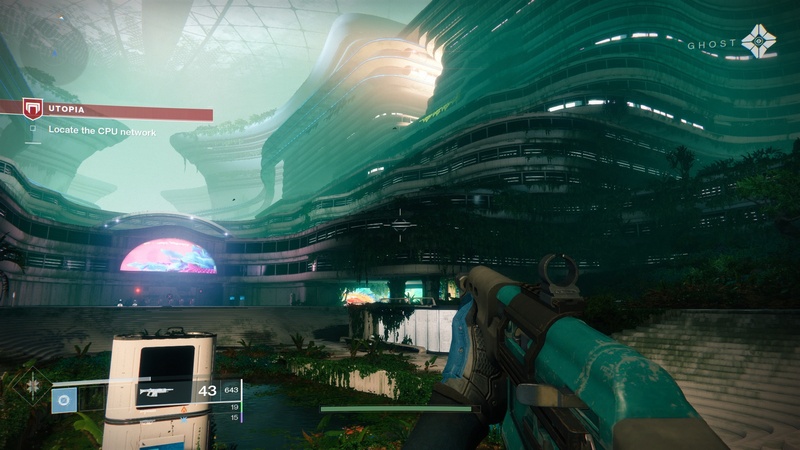 Here, I am on an arcology on Titan: the largest of Saturn’s moons, Titan is presented as an ocean world with large platforms in Destiny 2, a far cry from the methane-filled moon seen in Call of Duty: Infinite Warfare. However, most of the missions happen indoors, and amidst the platforms and machinery of Titan, the arcology proved an impressive space to move through. The Hive are the enemy encountered on Titan: these insect-like beings are similar to the Flood, especially in how they alter their environment to have a very organic composition. 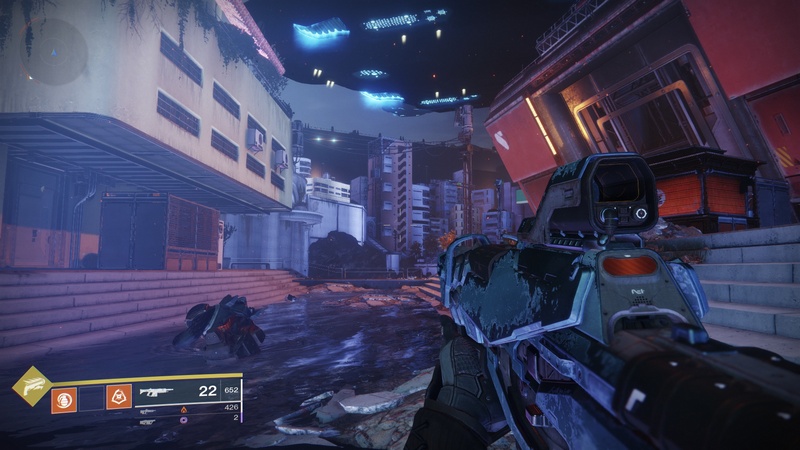 In Destiny 2, there are no specific weapons that work more effectively against the different alien species, and the Hive, while numerous, do not fight the same way the Flood do. One of the more interesting aspects of Halo was that fighting the Flood required a very specific loadout, and so, when one encountered both Covenant and Flood, it was a matter of constantly switching weapons to remain effective. In reality, Nessus is a centaur (a small rocky body with an unstable orbit between the outer planets) only some fifty-seven kilometres across. 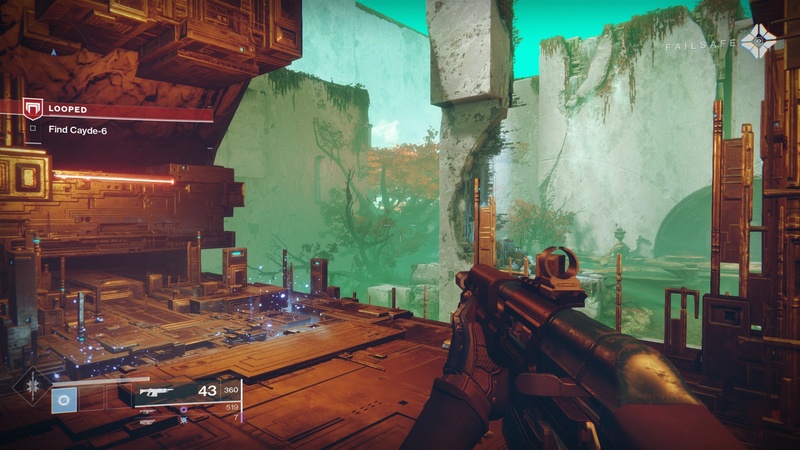 Destiny 2‘s portrayal of Nessus is a vibrant world with large, geometric constructs attributed to terraforming. It is here that players must rescue Cayde-6, and from a character perspective, the Nessus missions were among the most fun because of Failsafe, a Golden Age AI that sustained damage and as a result, has split personalities. Cycling between a shamelessly cheerful and apathetic personality, Failsafe’s dialogues were very entertaining, bringing to mind GLaDOS of Portal 2. Fighting the Vex here was straightforward for the most part, although I am rather less fond of the missions that involve jumping onto electrified platforms high in the air, where any mistake will involve falling to the surface and necessitate a long ascent back up. 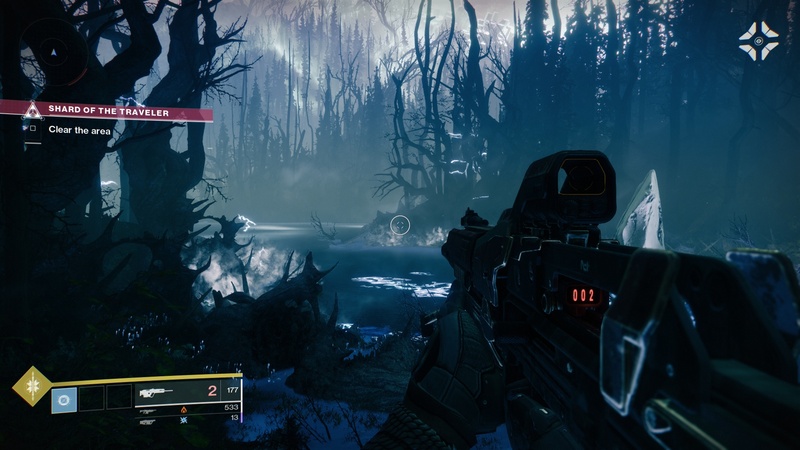 Upon returning to Earth, players must return into the dark forest and recover a second shard, which returns the Gunslinger ability. Up until now, I’d been running the Arcstrider, which gave access to an electric staff that dealt massive melee damage. As a Gunslinger, I have access to a flaming revolver that dealt up to ten times more damage per shot than any of my other weapons. 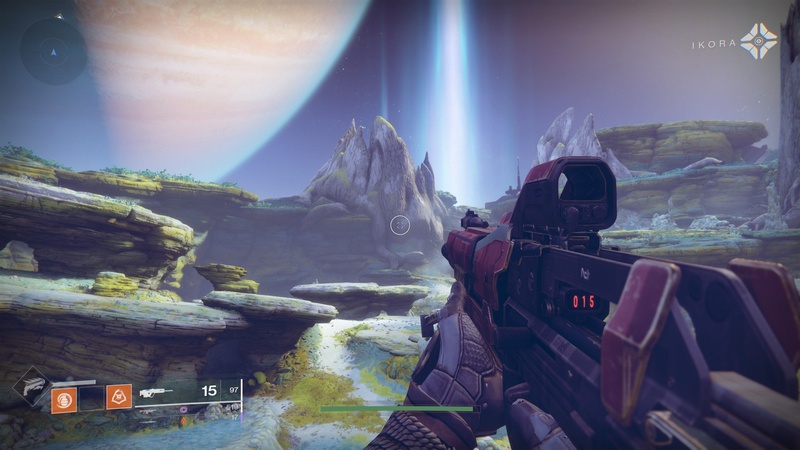 Io is the next destination in the campaign after one retrieves the Gunslinger ability: it is a barren world set under a majestic sky dominated by Jupiter. The real Io is a volcanic moon whose geological activity is a result of tidal forces between Jupiter and its other moons. As a result, the moon has many active volcanoes that can spew sulfur plumes 500 kilometres high. 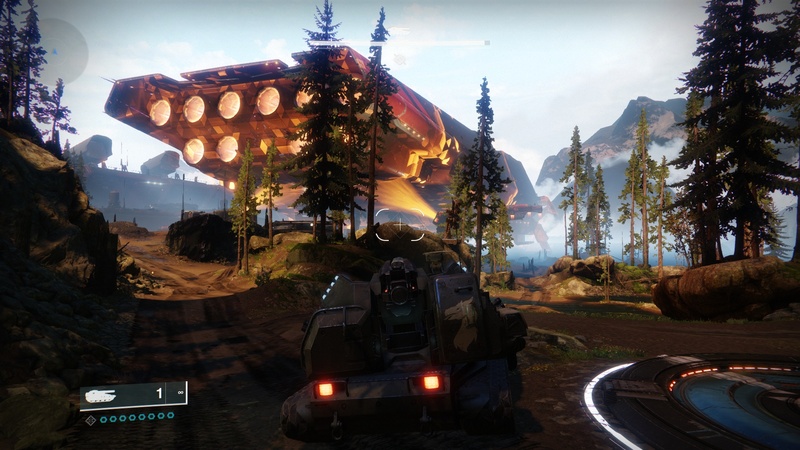 Post terraforming in Destiny 2, Io is more hospitable and is home to several mines. Here, I run with an exotic pulse rifle with void properties. 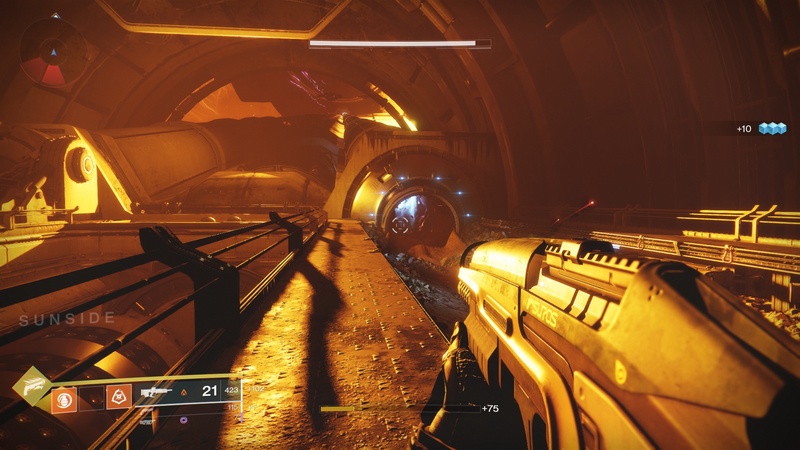 This burst-fire weapon proved surprisingly fun to use against the Taken, and on critical kills, could create explosions that damaged or destroyed nearby Taken, as well. Unlike The Division, exotic items in Destiny 2 can be acquired prior to hitting the level cap: I picked up exotic body armour as well as a reward for one of the campaign missions. The approach Destiny 2 takes with exotic items means that as one levels up and acquire more powerful items, the exotics picked up earlier become less viable. 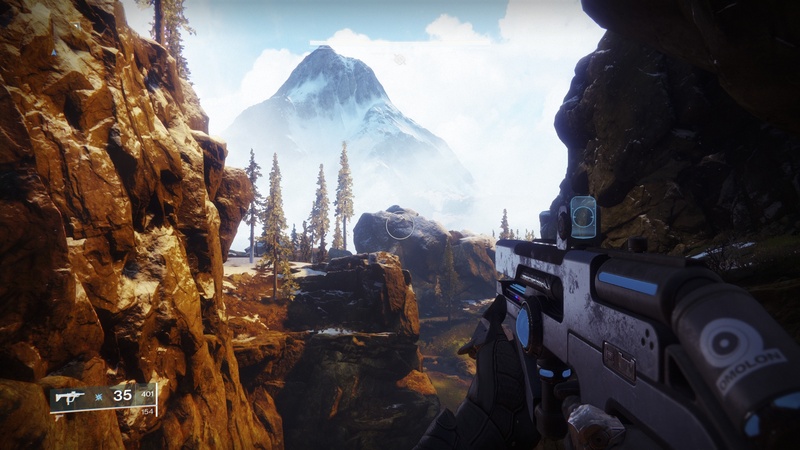 The European Dead Zone in Destiny 2 has some of the most beautiful landscapes out of anywhere in the game, and originally, I planned to uninstall Destiny 2 once I’d finished the campaign so that I could recoup the 80 GB of disk space that Destiny 2 requires. 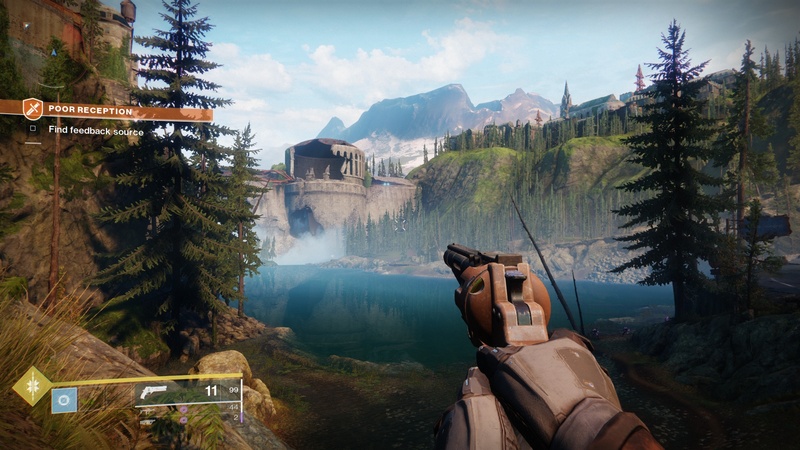 However, landscapes such as these offer a compelling case to at least go back and finish off some of the adventures that I’d skipped out on – I only completed adventures in order to get new gear and raise my level up to the point where I could continue with the campaign missions, but it would be nice to revisit some of Destiny 2‘s more picturesque locations again. 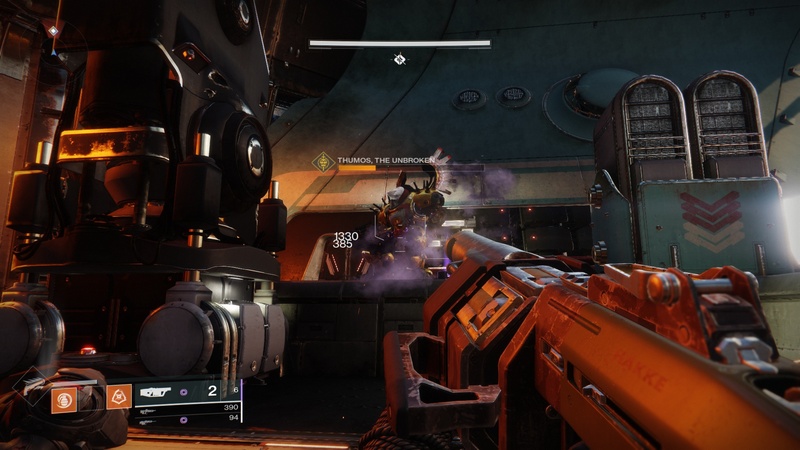 Upon returning to the EDZ at level fifteen, Destiny 2‘s campaign really kicks into high gear, and it is this part of the game that truly shines. The mission opens with players being granted a Drake tank that handles similarly to Halo‘s Scorpion MBT, differing in that the Drake has an ordinance launcher as opposed to a coaxial machine gun. It was superbly satisfying to blast enemy infantry and tanks alike in this mission, and the mission distinctly feels like the opening stages of Halo 2‘s Metropolis mission. After moving through the tunnels of Earth, players return back into the open, where a Cabal ship is docked. Using the Drake’s main cannons, I blast the shields and couplings, keeping the vessel grounded to end the mission. The next phase is to board the ship and fight one’s way to the bridge to eliminate the ship’s commander, before taking a smaller vessel and make for the Almighty. Compared to The Division, Destiny 2‘s menu UI was not quite as intuitive for me, especially when it came to skill and inventory management. Despite this, I managed to get by okay, scrapping old weapons and equipping items that worked with my playstyle. 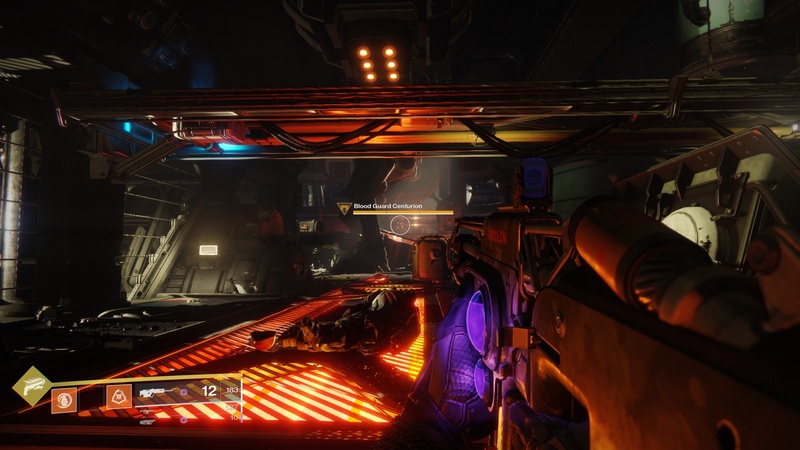 Here, in the bowels of the Cabal ship, I use a marksman rifle to engage distant enemies. The marksman rifles and burst-fire rifles are my preferred weapons of choice, providing enough firepower to deal with enemies at most ranges. There are weapons that use special ammunition, as well, but ammunition scarcity means that equipping these weapons would limit players to one primary weapon should they run out. For my part, even if the shotguns and sniper rifles are powerful, I did not tend to equip them. One of the challenges I had in Destiny 2 early on was simply knowing where to go. I recall that in my first mission into the salt mines, I entered the wrong building and tunnels. By this point in the campaign, however, navigation was not of a particular concern: using the Ghost and the waypoints provided was sufficient to get through most places without becoming lost. The heavy weapons of Destiny 2 use a special kind of ammunition and can deal massive damage against bosses. While comparatively rarer to come by, special ammunition still is fairly common, and I make extensive use of belt-fed grenade launchers to make short work of groups of Phalanxes (when there are too many of them to focus on shooting the centre of their shields). At one point, I wielded a sword that could defeat any non-boss opponent in one shot. Like the energy sword of Halo, the swords are constrained by ammunition, but they still act as standard melee weapons when depleted. The fight on the Almighty was a stunner of a mission: set in the punishing atmosphere around the sun, it’s a gripping mission that sees the player fight their way across the weapon to destabilise it and set it up for destruction, in a mission mirroring Halo‘s The Maw. The vastness of the level is apparent, and when Destiny 2 is at its best, its missions are more memorable than those of The Division‘s. While revolvers, known in-game as hand cannons, are incredibly powerful and can one-shot common enemies with a well-placed round to the head (or weak spot), I often find myself fighting hordes of enemies. Curiosity, however, leads me to continue wielding them, and they are quite effective, although for longer range combat, the scout rifles tend to be more effective. The last time I played a game involving stopping a superweapon capable of incredible destruction would have been Halo CE: Bungie is fond of their superweapons, and the Almighty is a Cabal weapon that uses magnetic fields to destablises the forces holding a star together, causing gravity to exceed the thermal pressure of a star. The resultant explosion is powerful enough to level an entire star system, and the Cabal are said to have destroyed numerous systems in this way. Notably, the Almighty is a weapon the Cabal have constructed with their own technology, standing in contrast with the Covenant, who only aim to use the Halo array. Once players destroy the cooling system on the Almighty, the weapon destablises and destroys itself. The threat of total solar annihilation is gone, and now, players turn their attention to Ghaul, the remaining loose end in Destiny 2. 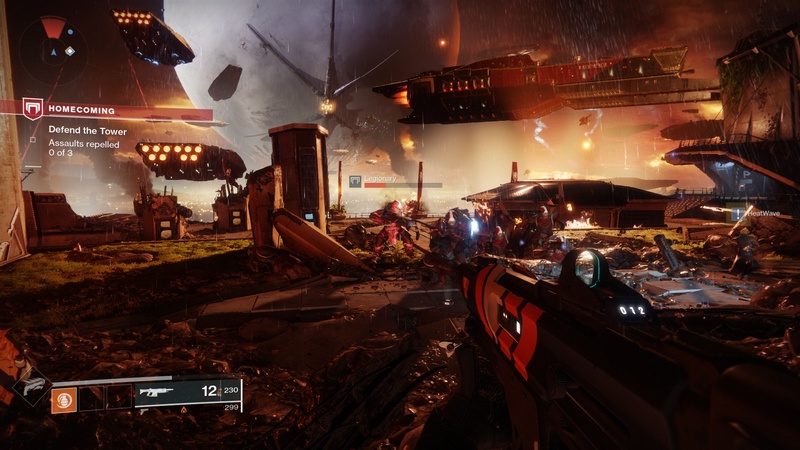 Returning to Earth, players fight through the Last City in a bid to stop Ghaul. Once Destiny 2 picks up, its campaign does not hold back in terms of entertainment value, and more so than any other part of the game, save the opening, I was totally engrossed in this final mission, to the point of finishing it in a very short time span. 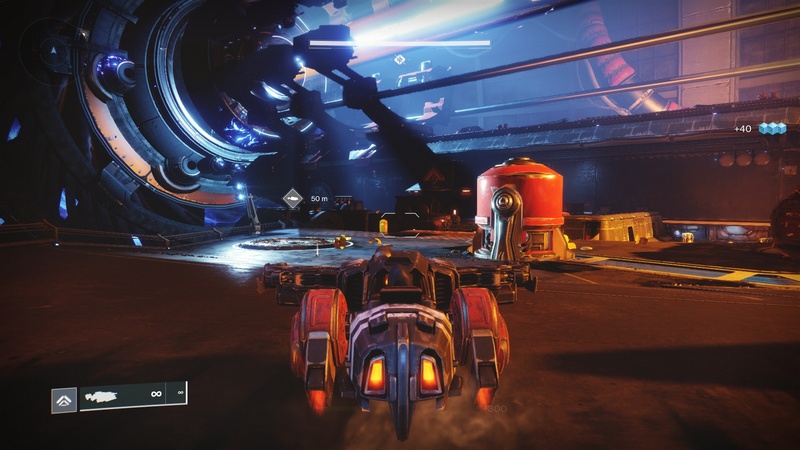 The final mission uses the same song that was heard during the escape from the war beasts in Destiny 2‘s earlier sections, likely meant to signify the beginning of the end and the notion of cycles. For folks looking to pick up Destiny 2, I’m not sure whether or not it will be free again; the opportunity to pick up the game on Battle.net ended on November 18. Players looking to get Destiny 2 now will also need to buy the Forsaken expansion, which raises the level cap and brings new items to the table for players to unlock. On the whole, since I got the game for free, I’ve got no complaints about it; it was quite entertaining, although at present, I’m not sure whether or not I’ll have the time to continue playing for new gear the same way I did for The Division, and so, I’ve got no plans to buy the Forsaken expansion. The final fight with Ghual is titanic and fun: it’s no different than squaring off against the Zerstörers in Wolfenstein 2: The New Colossus, in that sure aim and liberal application of the Guardian’s powers will make short work of Ghaul who, for all of his bluster and showboating, is still mortal. With Destiny 2 in the books, the question of what I’m doing now is likely to be raised. First and foremost, I will be writing about The World in Colours now that the ninth episode is out, and then turn my focus to Battlefield V, which I decided to buy. It has been quite some time since I’ve played a Bungie game on PC, with Halo 2 PC being the last Bungie title I’ve completely experienced the campaign of. Like The Division, having proper gear makes a significant difference in one’s performance, and players will find themselves swapping out gear constantly as they level up. 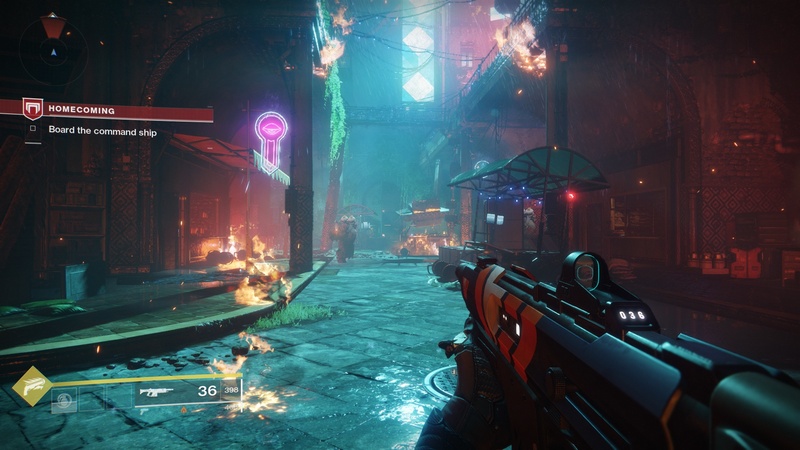 Because Destiny 2 is a shooter at its core, having good weapons make all of the difference: players have access to one kinetic weapon, one energy weapon and one power weapon. This is reminiscent of Halo, where kinetic weapons dealt more damage against unshielded opponents and energy weapons were effective for stripping away shields. Power weapons are excellent for boss fights and dealing with large groups of enemies. For the most part, weapons have manageable recoil, and my go-to weapons were the burst-fire weapons, which handle in a manner not unlike that of the Battle Rifle. 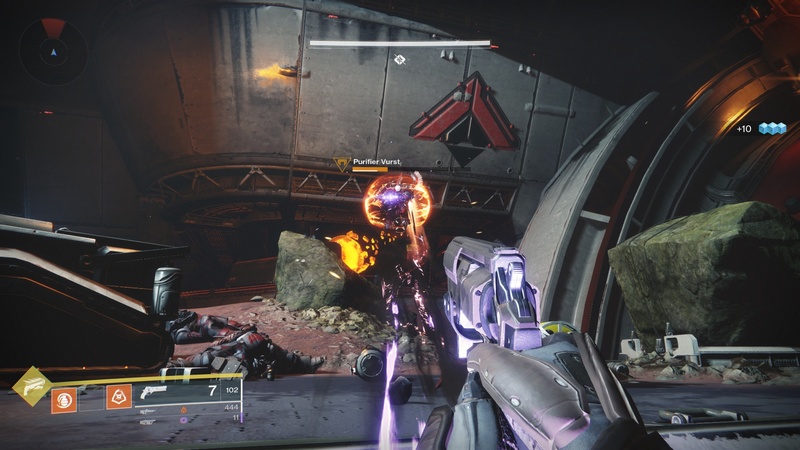 Short bursts of fire were more than sufficient for dealing with enemies, and interspersed with the appropriate use of one’s super ability and power weapons, Destiny 2‘s campaign was rather fun. For many players, the real fun begins here: advancing one’s power level by completing end-game activities and acquiring increasingly awesome gear. However, as much as I’ve enjoyed Destiny 2‘s campaign, I believe that my journey ends here for the present; the prospect of spending hours acquiring items is admittedly a daunting one. 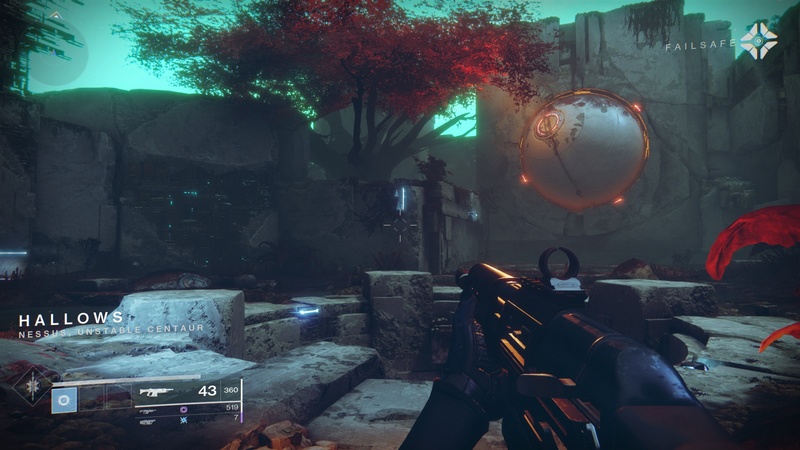 Having said this, I am very glad that Activision and Bungie did make Destiny 2 free: I never expected to have a chance to go through Bungie’s newest shooter, which is likely the closest I’ll come to playing a contemporary Halo-like game in the PC for the foreseeable future. Set after the events of Lagaru, Overgrowth follows Turner after he defeated the alpha wolf and the corrupt monarch, Hickory, avenging the death of his family. Since then, he has wandered Lugaru seeking a new purpose. After bandits begin ravaging the island, Turner decides to investigate and help dispossessed find a new home in a mythical island in the sky. Turner reluctantly help those in need, finding himself entangled in a much deeper conflict involving slavery. Fighting his way through frigid glaciers and distant swamps, Turner is captured by the cats and proves his combat prowess in the arena, before killing off the leader of the cats. Turner eventually reaches the island and after ascending its sheer walls, reaches the top, where he kills its leaders. No longer denied homes, the rabbits aiding Turner find a new home, and Turner himself sets off, continuing to seek his purpose. 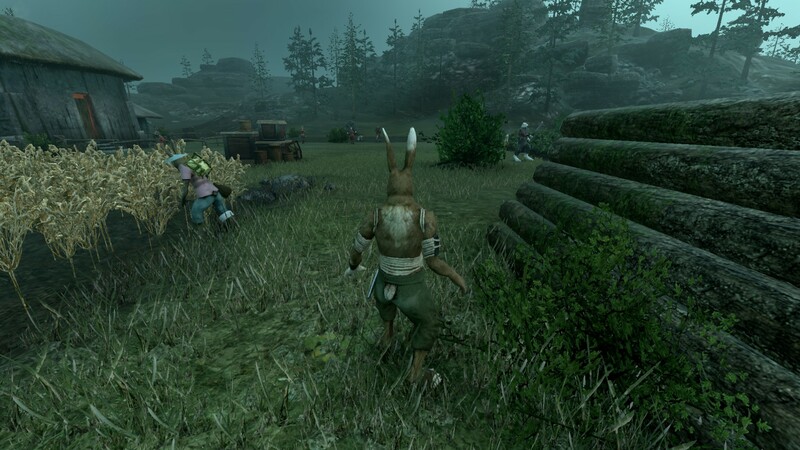 This is Overgrowth‘s main campaign; clocking in at around four hours, it’s concise and accompanied by a remastered version of Lagaru, Overgrowth‘s predecessor. 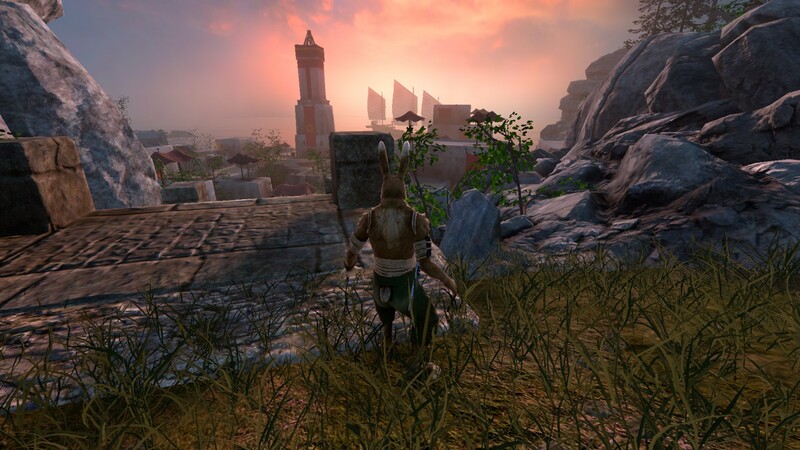 The game’s defining feature is that its development started around a decade ago, and in its finished form, the title very much feels like a demonstration of Wolfire’s Phoenix Engine, which is a technically impressive system; the main campaign showcases the different physics aspects available in Overgrowth, as well as a highly-evolved combat system. 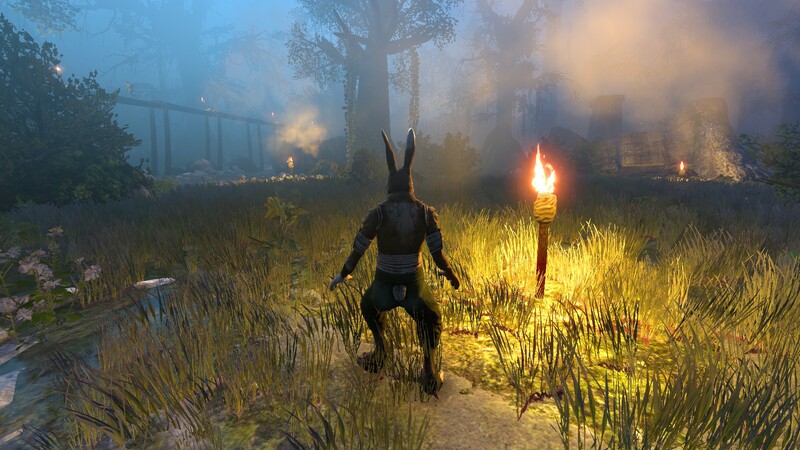 However, with only a pair of short campaigns and a few modes beyond this, Overgrowth comes across as being much more limited in content. 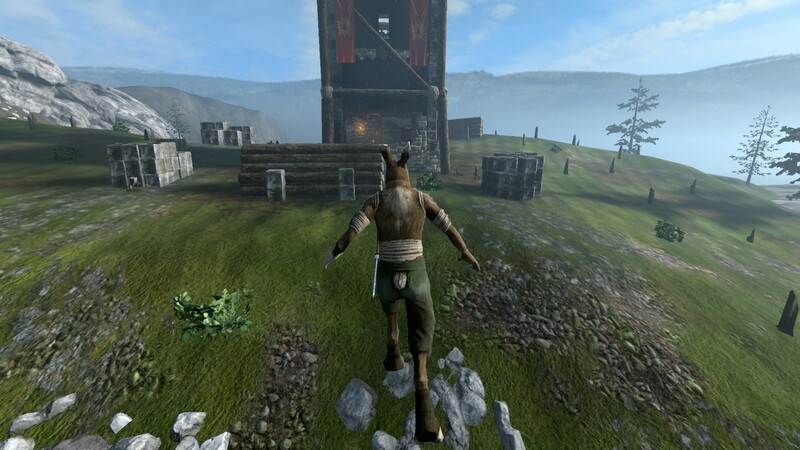 Overall, the combat and parkour system in Overgrowth are the game’s greatest strengths. The context-based fighting system is quick to learn but has a remarkably high skill ceiling: like Receiver, Overgrowth is very punishing. As Turner, players are able to hold their own on skill, but brute force will quickly result in death. 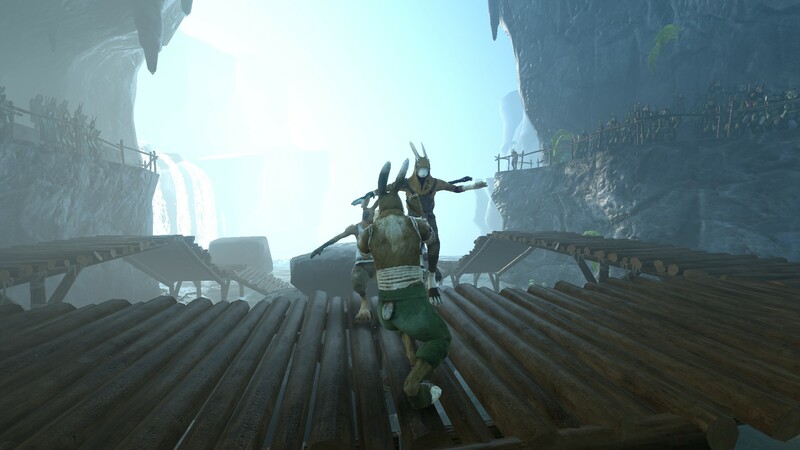 Overgrowth‘s campaign rewards players who strategically make use of the environment to survive, as well as those who’ve taken the time to learn the fighting system. Consequently, every successful kill in the campaign is a satisfying one, and the game reinforces this by slowing things down on each kill. 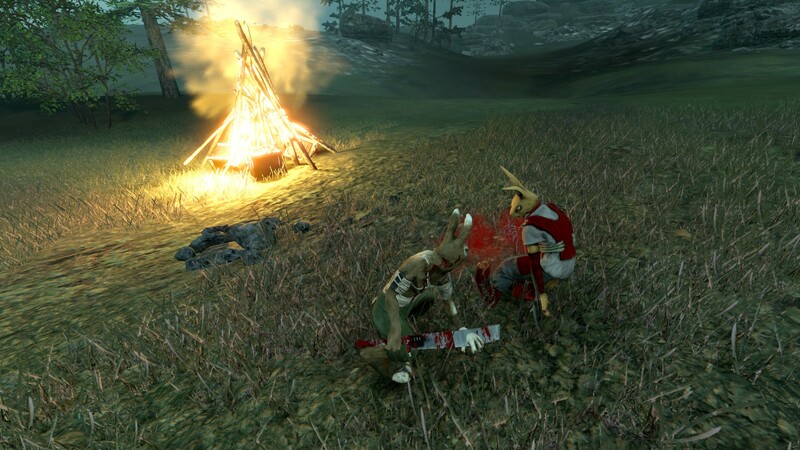 It is incredibly satisfying to survive a fight against large groups of opponents, whether they be other rabbits, rats, dogs, cats or the nigh-unstoppable wolves. Each of the different opponent types require a unique approach: Turner can stand toe-to-toe with other rabbits and rats, but cats, dogs and wolves involve strategy in order for Turner to survive. Turner can also make use of weapons to bolster his survivability in a fight, and against superior opponents, the terrain becomes an ally, as well – I’ve won most fights against wolves simply by kicking them off ledges. Similarly, Overgrowth has a particular emphasis on navigating vertical landscape features to reach a destination. While the controls are a bit challenging, once mastered, players can scale sheer walls and jump across vast distances. It is as satisfying to climb to the top of a structure as it is to survive a fight, and on both counts, Overgrowth‘s central features are well-implemented. With a narrative tying things together, it was superbly enjoyable to see the game exit the beta stage and become a full-fledged, if somewhat short, title that could form the basis for a much more content-rich game: it’s clear that the Phoenix Engine is quite powerful, and with the basics finished, I would like to see Wolfire use this engine to its full potential with a game that has a more detailed story. 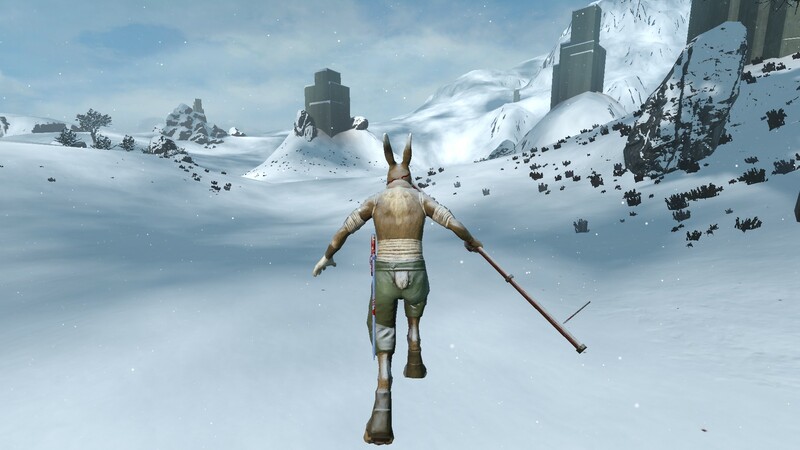 It’s been just a little less than four years since I bought Overgrowth during a Steam Sale while the game was still in its alpha stages: I experimented with the game only briefly and did not have too much to say about it, but now that Overgrowth is technically finished, with two campaigns, the game’s worth returning to, and returning for the first time since 2014, I’m impressed with the lighting effects and visuals. 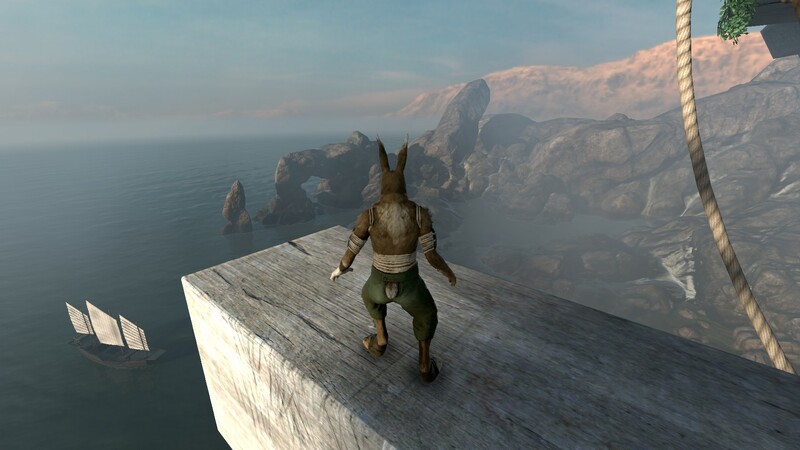 While Overgrowth‘s textures are a bit dated and the lower polygon count is visible, the lighting effects and sense of scale in the maps have seen considerable improvements since the early days of the alpha. 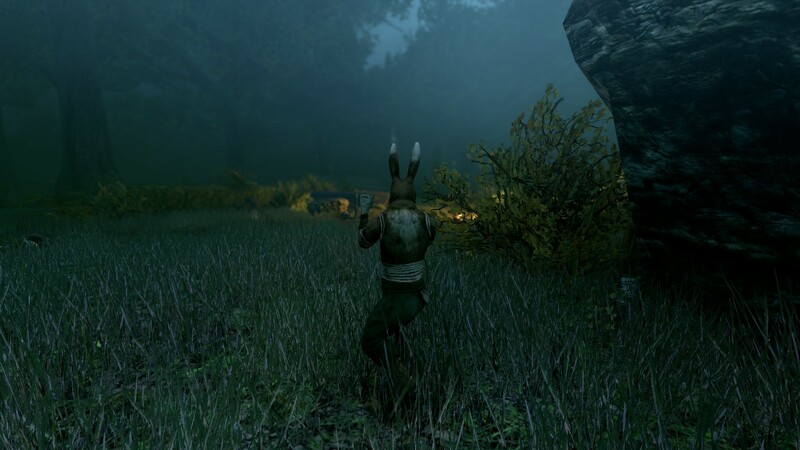 Missions in Overgrowth‘s campaign are usually broken up into two types: ascension and combat. Ascension missions involve parkour to reach the top of a map, and combat missions entail fighting a large number of enemy combatants. 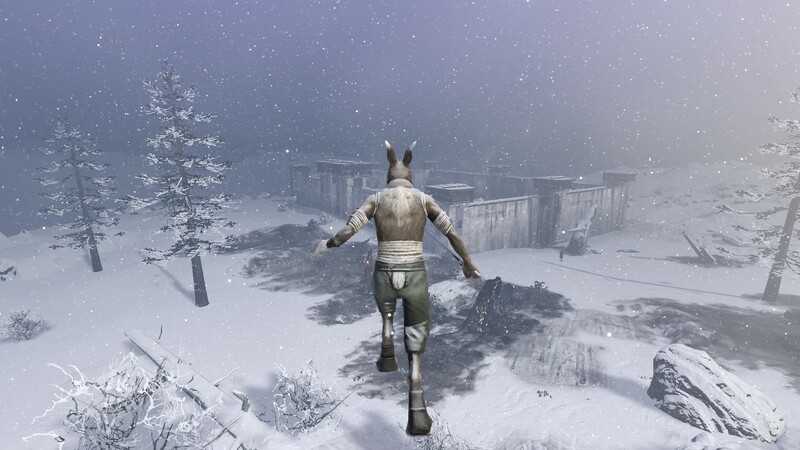 As a rabbit, Turner can jump great distances, an ability that is useful for both parkour and combat as a defensive tactic; being able to escape swarms of enemies is especially important, since Overgrowth lacks a HUD: Turner will go down every quickly to large numbers of enemies, and against certain kinds of enemies, will die in a single blow. Thus, a large part of the gameplay is picking one’s engagements wisely and making use of the environment to assist in combat. In conjunction with punches, kicks and blocks, Turner can silently dispatch enemies by means of stealth take downs to avoid alerting nearby enemies. 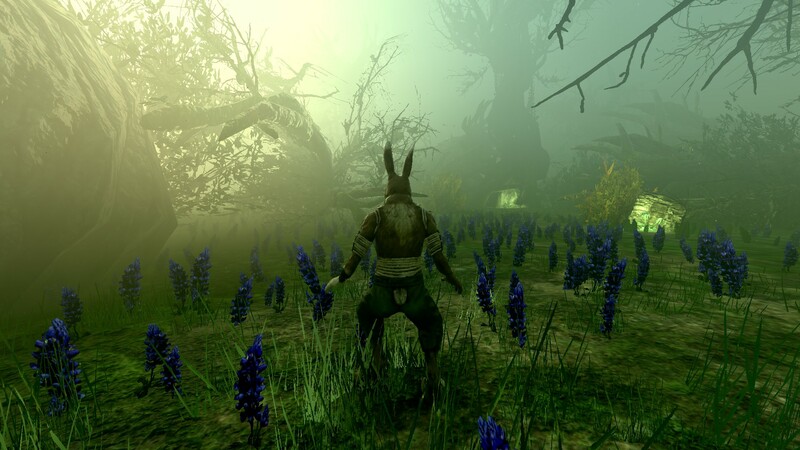 The AI in Overgrowth has been meticulously designed and will begin investigating if players are not careful in their approach: once combat breaks out, all stealth goes out the window, and fighting multiple opponents simultaneously is difficult, so like most stealth games, if one can commit to not being spotted, missions in Overgrowth become much more straightforwards to complete. 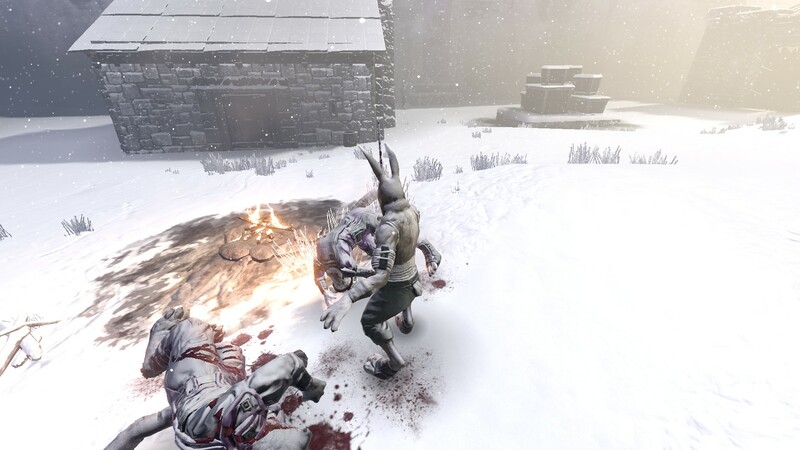 Weapons in Overgrowth come in two varieties: two handed weapons that deal massive damage at the expense of mobility, and one-handed weapons that can be employed very quickly. Weapons can be thrown, although the AI will pick up any missed weapons and use them against Turner, block them with weapons of their own or even throw them back. When used properly, weapons can one-shot most opponents. 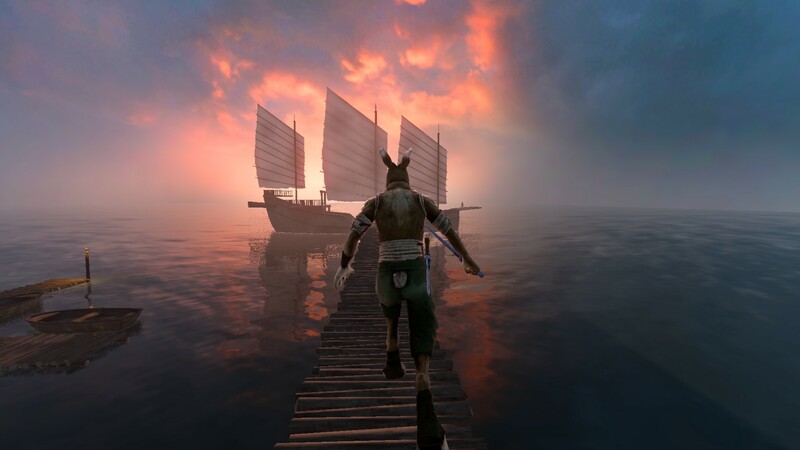 A Chinese-style junk is visible at this port city: Turner visits a vast range of locations in his travels, and while Overgrowth‘s narrative is constrained by a lack of cohesiveness, it does allow players to see a variety of locations. 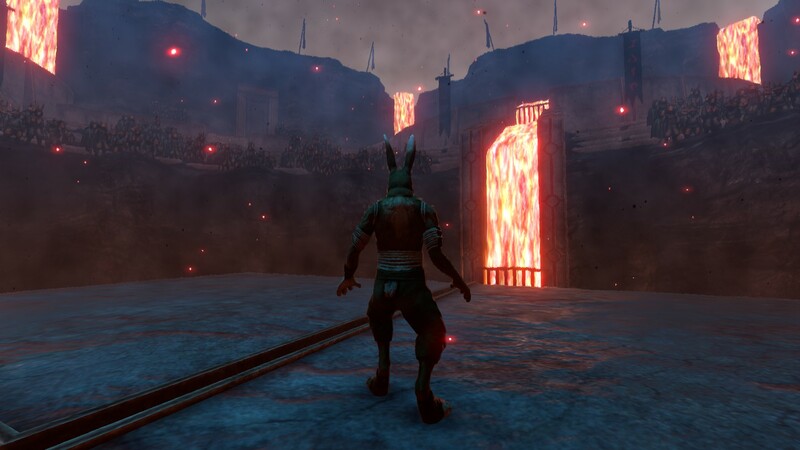 Wolfire only has four employees, all of whom have backgrounds in programming, development and 3D modelling: Overgrowth is by far their largest title, and so, it is understandable that Overgrowth does not have a more powerful story or voice acting. Water effects in Overgrowth are impressive, but there’s no opportunity to go swimming in Overgrowth: if Turner falls into deep water, he will die instantly. 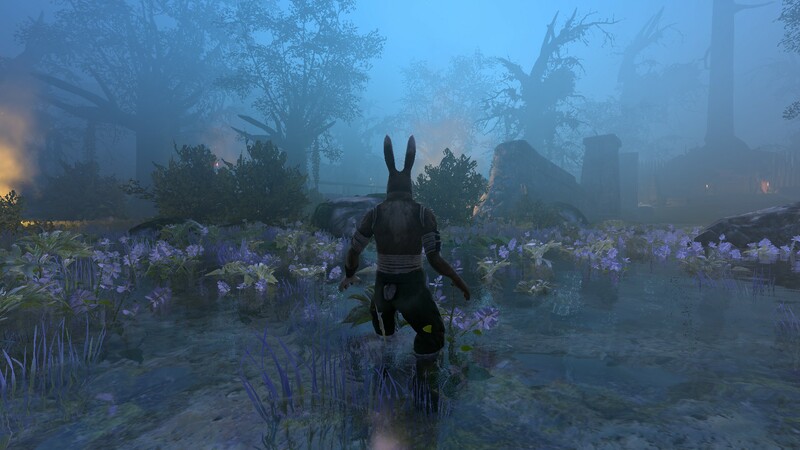 Overgrowth states that rabbits cannot swim to explain this mechanic: while rabbits can in fact swim to escape dangers, this is an action they are absolutely not fond of, since they become waterlogged very quickly. The resulting cold and panic can lead to drowning, and since rabbits can be literally scared to death by a shocking change in conditions (by the way, this is the correct way of using ‘literally’ in a sentence), rabbits avoid swimming where possible. With a pair of swords in hand, I effortlessly decimate all of the crew on board the junk, including the boss that comes out. 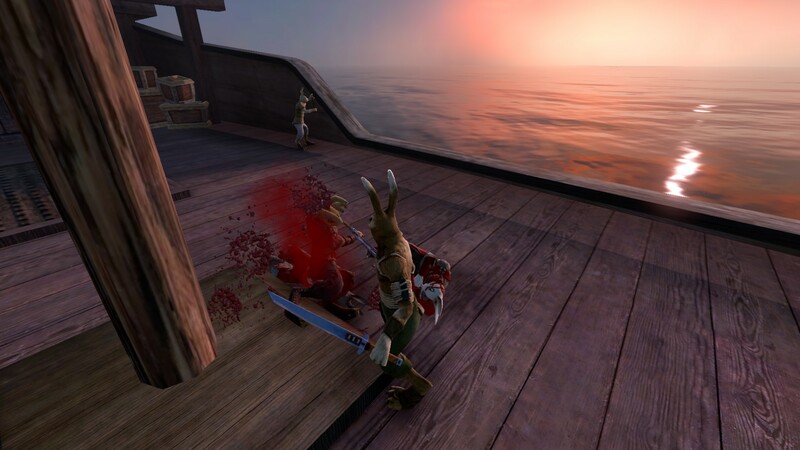 Blood effects and ragdolls in Overgrowth are fun, adding satisfaction to finishing each fight. Besides swords and knives, spears and staffs are also available. Weapons can be sheathed when not in use, and there are occasions where it’s better not to have weapons drawn, since they can be knocked from one’s hands during the heat of combat. Besides other rabbits and mice, Turner will also encounter dogs, cats and wolves in Overgrowth. Having weapons allows Turner to even the odds out somewhat, but Wolves, being the most powerful animal in the game, can absolutely tear Turner apart. Getting up here from the ocean was no cakewalk, involving all of my resourcefulness to find spots on the shear walls to parkour up. I ended up beating the wolf by using the jump kick, an overpowered move that propels enemies back, and kicked it off a ledge. The jump kick is a fantastic move for creating space and dealing massive damage to enemies, but because it propels Turner back a large distance, as well, there are risks to using it. 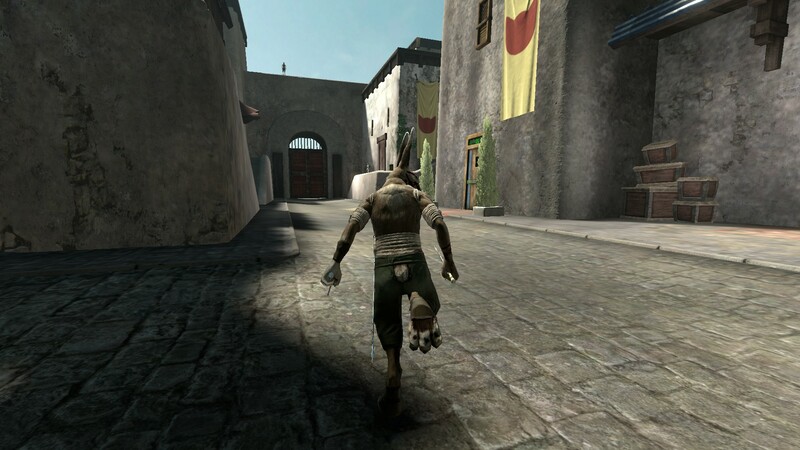 Wolfire has since patched Overgrowth so that AI will respond more effectively towards jump kicks by evading: it proved incredibly effective against wolves, who could be insta-killed if they were kicked over ledges and fell great distances. 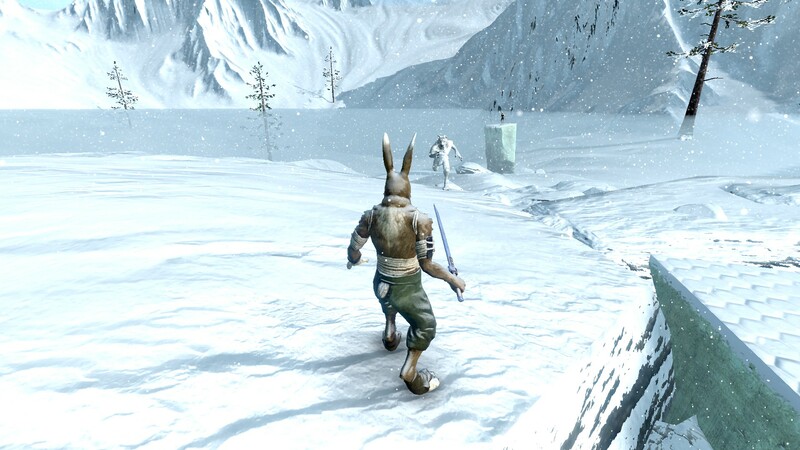 I spent a portion of Christmas Day and Boxing Day playing Overgrowth; the cold, snowy environments perfectly capture the feel of a frigid Canadian winter, and I recall the many attempts it took to sneak past the dogs and lure them into single combat. I eventually managed to best them, and savoured the victory: if there’s anything Overgrowth excels at, it’s creating a sense of satisfaction and accomplishment with each fight won. 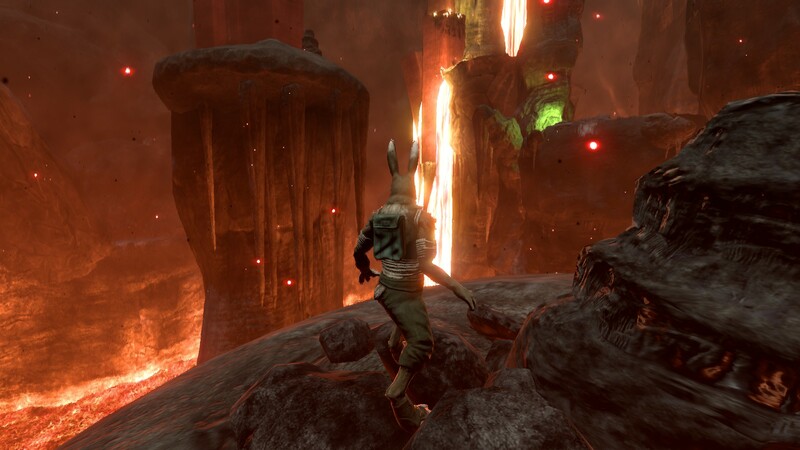 Like Receiver, Overgrowth is very unforgiving with its gameplay, and this is compounded by the lack of a UI; to counteract this, Overgrowth allows for near-instant respawns that put players right back into the things. This feature allows one to experiment with different approaches towards a problem until a solution is found. I recall a six-on-one fight in one of the glacier missions where the ability to instantly respawn proved to be superbly useful: guards travel in pairs in this mission, and taking one out while the other is not looking is not possible. I ended up using stealth to take one out before going loud with a weapon with the other. 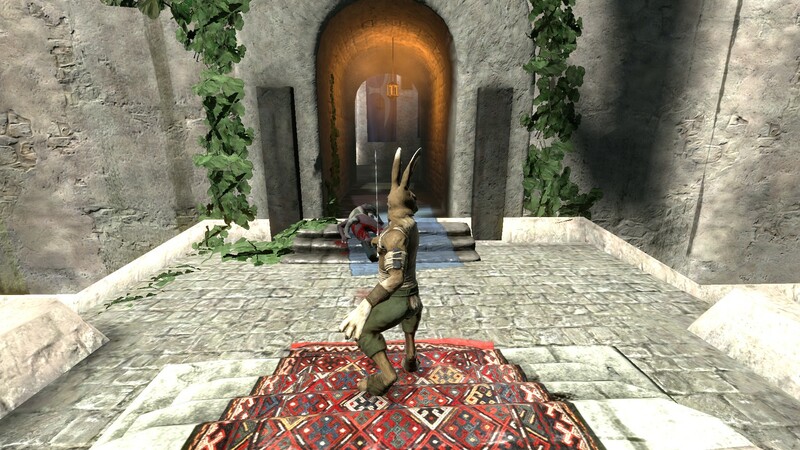 The combat system in Overgrowth is very complex, and while easy to learn, mastering the controls is another story. Turner goes from fighting in the cold glaciers to fighting in a fetid swamp. While lacking the steep drops of the glacier missions, the swamp is a dreary place that is quite easy to get lost in, and the lack of a HUD forces players to keep an eye on visual cues in the environment in order to figure out where to go next. They can be subtle, especially under low light conditions, and so, players might be forced to backtrack and explore. Fighting rats in the swamps turned out to be relatively straightforwards: rats aren’t particularly challenging as a foe. 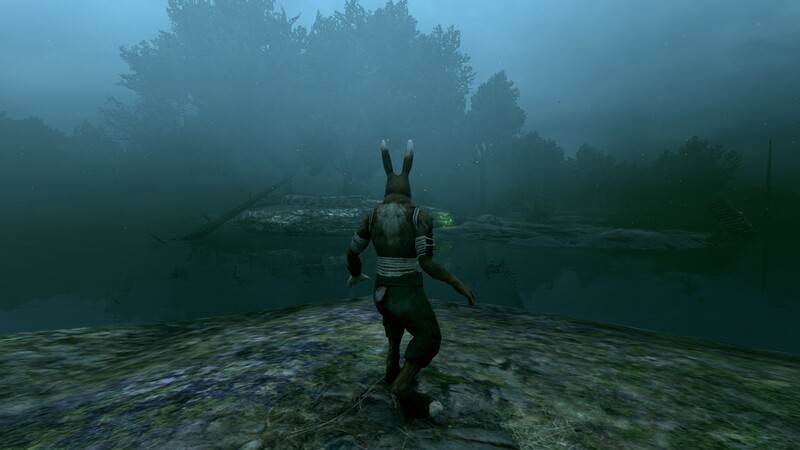 Looking back, Overgrowth‘s development timeline was probably the biggest impediment the game had during its developer cycle. 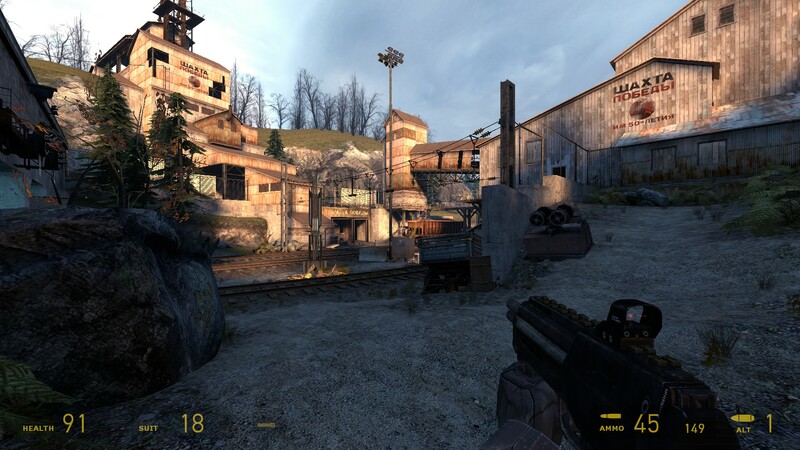 People wondered if the game would ever exit the alpha stage, and while the developers were constantly pushing updates, the game remained in alpha and beta stages for a few years. One aspect of Overgrowth that sees very little discussion elsewhere is the game’s soundtrack. Composed by Mikko Tarmia, the music of Overgrowth is majestic, brooding and fits the game’s setting of a post-apocalyptic world. I would absolutely love to see a soundtrack, which, unfortunately, is not available for purchase at the time of writing. I recall listening to the game’s main theme frequently while writing Objective-C code, and because of our lab’s yearly excursions to Canmore, the soundtrack also reminds me of the mountains and valleys on the way leading into Banff National Park. It attests to how much time has passed, now that Objective-C is being phased out in favour of Swift; when I began my time as an undergraduate researcher seven summers ago, I was a volunteer. My initial applications for funding were unsuccessful, but I decided to stick it out, since my goal was to learn, and two months in, I managed to build a simple model of blood oxygenation and deoxygenation in the lab’s custom game engine. Impressed, my supervisor switched me over to a funded programme, and I began work on a fluid flow model using agent-based approaches. The mission to climb to the top of a tree and reach that glowing bucket proved to be an exercise in patience, and like the ascent to the top of a snow-covered mountain, it was immensely rewarding to actually reach the top and finish the objective. This is probably the “sense of pride and accomplishment” that all game developers want their players to experience; while the way to the top is marked by bioluminescent fungus, Overgrowth offers few other cues and suggestions, leaving players to work out how to get to the top. By my second year, I managed to win the OCSS, a small scholarship for students enrolled in the Health Sciences program to do summer research. That summer, I continued on with my flow model after implementing a selectively permeable membrane system. Work on the flow model proceeded into June, and after spending many summer days tuning it, I was surprised to see my entities moving in a convoluted vessel without being stuck in the walls. I subsequently tried the algorithm out on a nephron model that we had, and it proved successful, so I spent the remainder of the summer trying to mimic renal flow and reabsorption, making use of the selectively permeable membranes in the process. The camp in the swamp is such a visually impressive level with its lighting effects, and while quite difficult to nagivate, it was worth exploring every corner of this map to find the exit after all enemies had been eliminated. During this level, the intense fighting meant that I lost my weapons, but Overgrowth‘s jump kicks are overpowered to the point where they can be used if one lacks weapons. On a map with no ledges, this tactic is not a particularly dangerous one. During my third summer in my undergraduate program, I did not return to the lab until August, having been entangled with the MCAT, but once that finished, I helped get a paper submission off the ground. By my fourth year, my old work with the nephrons eventually led me to build a multi-scale renal model in our lab’s in-house game engine, and I returned to this project that summer with an NSERC USRP award, building a distributed model that allowed different computers to share information with one another. In this implementation, I had one computer handle the renal calculations and the other handle cardiac functions. As they shared data, their visualisations, run locally, would be updated. As we reach the end of Overgrowth‘s campaign, the levels become much more ominous in nature, featuring lavafalls and hellish environments. I fight in an arena here against increasingly difficult opponents, until at last, wolves are introduced. Wolves are terrifyingly powerful – Turner is no match for one in a straight-up fight, so I utilised hit-and-fade techniques, making use of distance to my advantage and waiting for the right moment to jump-kick a wolf into the lava below, which is an instant death. There was an occasion where I mis-timed one of my jumps and took myself out, but in the end, I managed to secure the win. Turner is tasked with retrieving something whose value I cannot quite remember, but what I do remember of this mission is that it involves ascending ever-higher. It was quite the achievement to reach the top of the map and make my way back down: the way down was actually quite tricky, and even with the bioluminiscent markers helping, there were a few occasions where I overestimated how much falling damage that Turner could take. Turner is later pitted against opponents of varying difficulty in another arena, and it was here that limitations in the pathfinding for some of the AI became visible. I exploited these limitations to win all of my matches, and during one match, managed to wrench a weapon from an opponent and turned things around instantly. While the organisers of the match are impressed, Turner will have none of this and proceeds to masacre all within the arena, including the cats running the event. After killing off everything in sight, Turner must escape the cat’s desert city. The streets are unusually quiet, and it’s a good idea to hold onto any weapons one may have for the upcoming fight ahead: a number of cats stand between Turner and freedom, but compared to the fight in the arena, this one is relatively straightforward in nature. Unlike the Wolfire Team, who continued to develop their Phoenix Engine until its reached the level of sophistication that it’s at today, our lab slowly phased out the in-house game engine once Unity made their engine freely available. While our own engine was robust, powerful and extensible, its biggest constraint was that it was not optimised; even simple simulations only ran at around 30 FPS, and more complex simulations would drop down to 10 FPS. This coincided with the arrival of The Giant Walkthrough Brain, and when I managed to build a functional prototype within two weeks, Jay Ingram and my supervisor were impressed with the engine’s capabilities. Since then, my old lab has used both Unity and Unreal. While I’ve remarked that Overgrowth reminds me of Canmore and its surroundings, one should not expect to find such a structure in Canmore. This is the legendary country in the sky that was being referred to throughout Overgrowth. This is the culmination of all of the parkour and ascension skills that players have accumulated over the course of Overgrowth, and even then, climbing up here is no walk in the park. There are long jumps and tricky catches to make: any mistake will send Turner falling many metres into the water below, resulting in an instant death. With the Phoenix Engine in a good state, one wonders if the Wolfire team will hire script writers and voice actors for any titles they might choose to make in the future. 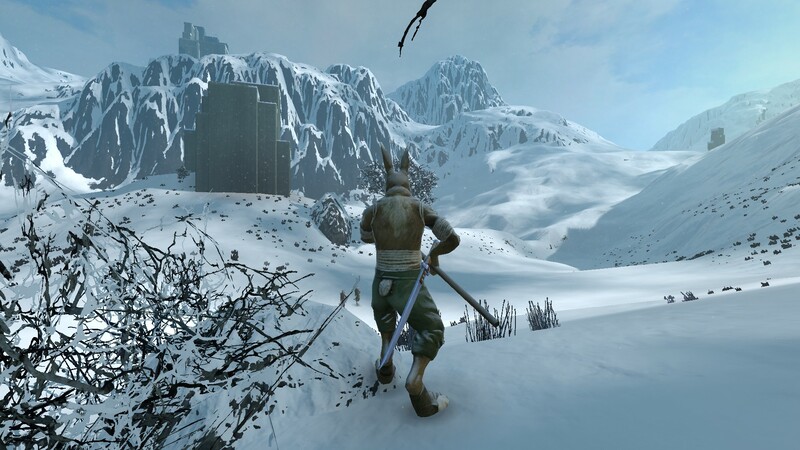 Since Overgrowth, I’ve not heard any news that the Wolfire team will be moving onto new projects, and from the looks of things, they will continue improving Overgrowth. In the time since I completed this game, two patches have come out to improve the AI and game performance. I stop for a few moments to admire the scenery up here before continuing on. Once reaching the top, a brief fight awaits Turner. Beating down the tower’s leaders will bring an end to Overgrowth, and while the campaign was very short lived, it was quite entertaining. 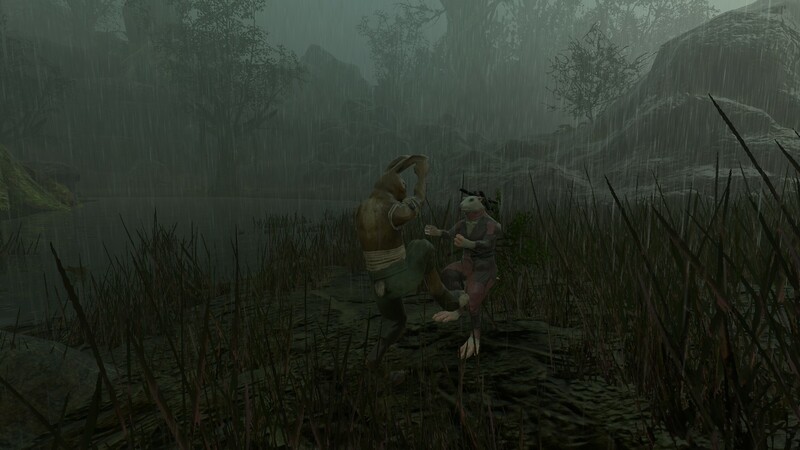 The fights are easily the best aspect of Overgrowth, especially with respect to how things slow down when a zone is cleared. 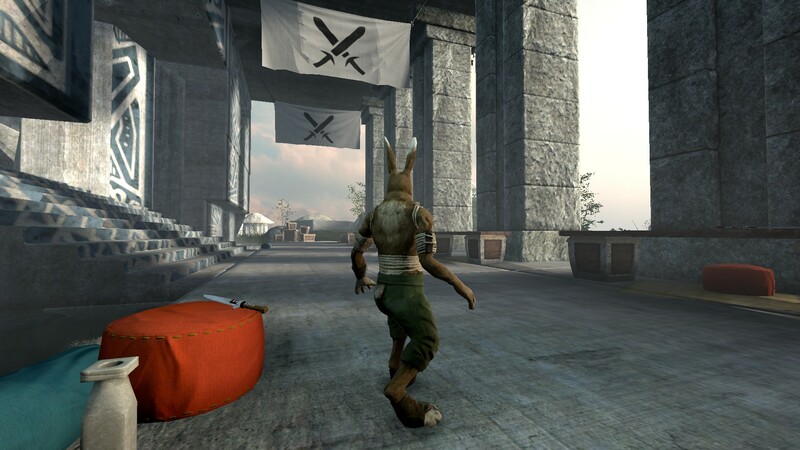 Overall, while I cannot say I recommend Overgrowth as a game, I can say that the game is a very pleasant reminder of my days as a university student. I bought the game mainly as a token of thanks for the Wolfire team, whose efforts and updates motivated me to delve further into the world of biological visualisations. With this being said, if people do not mind the shorter campaign and somewhat unoptimised performance, and they have a greater interest in all of the map tools than I did, then Overgrowth is not a particularly bad purchase, especially if on a sale; there are a host of worse ways of spending 33 CAD. 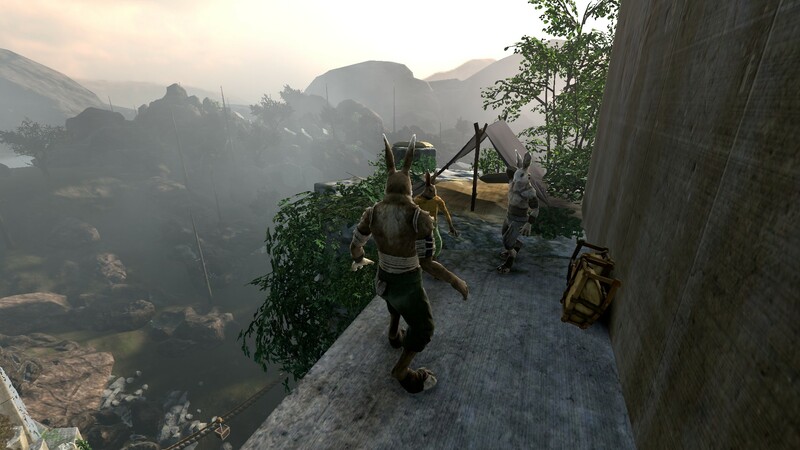 Having been in development since 2008, Overgrowth definitely feels dated with respect to its visuals, but the Wolfire team’s efforts have resulted in a superbly mature game engine that handles Overgrowth‘s fighting and parkour system well. 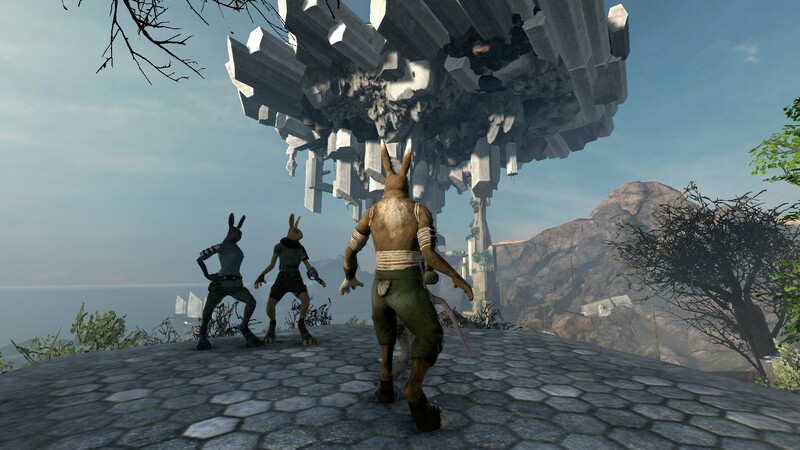 The campaign is quite short, and it appears that the flexibility of Overgrowth‘s game engine stems from a desire for the community to create their own content. Work on this engine is why Overgrowth‘s development has spanned the greater part of a decade: I learned of Overgrowth during my first summer as an undergraduate researcher – my old research lab had developed its own game engine in-house to provide a 3D space in which to model and visualise biological systems. 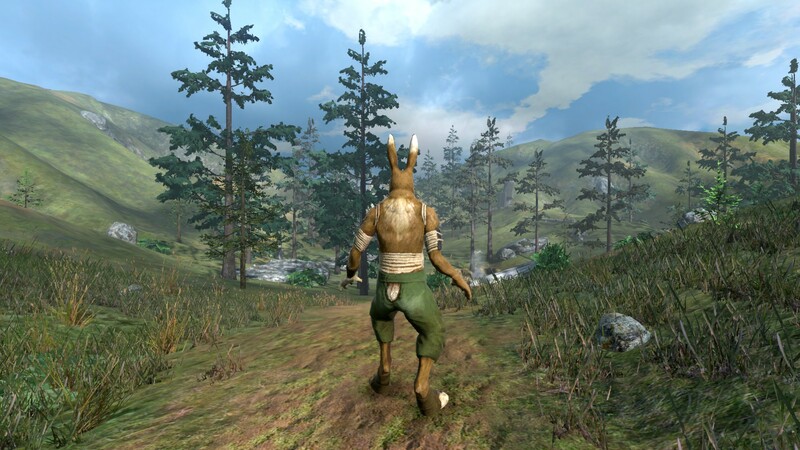 The lead developer on this project drew inspiration from Overgrowth‘s map editor, especially the transformation, rotation and scaling tools, to make it easier for objects to be placed in 3D space. This in-house game engine powered my thesis, and while it’s been replaced by commercially-available game engines like Unity, it formed the basis for the work that I would end up doing for my Master’s Thesis. 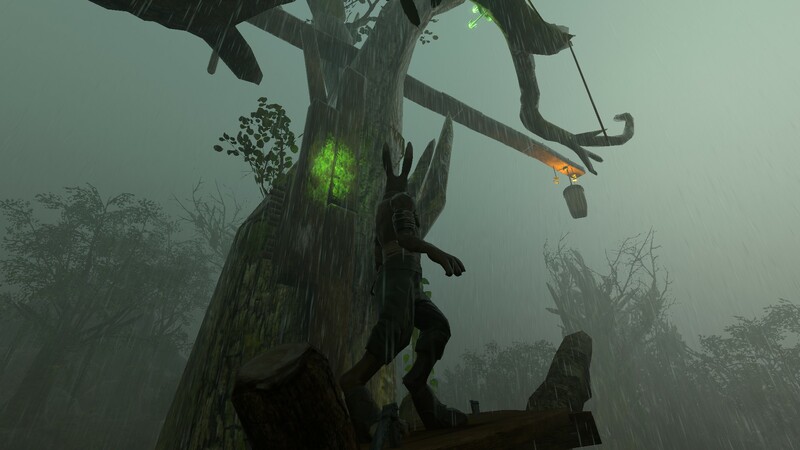 Consequently, while Overgrowth might not be an impressive title from an entertainment perspective, there are features in Overgrowth that directly inspired the work at our lab. Improvements to our in-house game engine’s ease-of-use and navigation eventually led me to build a visualisation of the renal system at different scales, complete with a mathematical model to depict responses of my virtual renal system to various stimuli, for my undergraduate thesis. 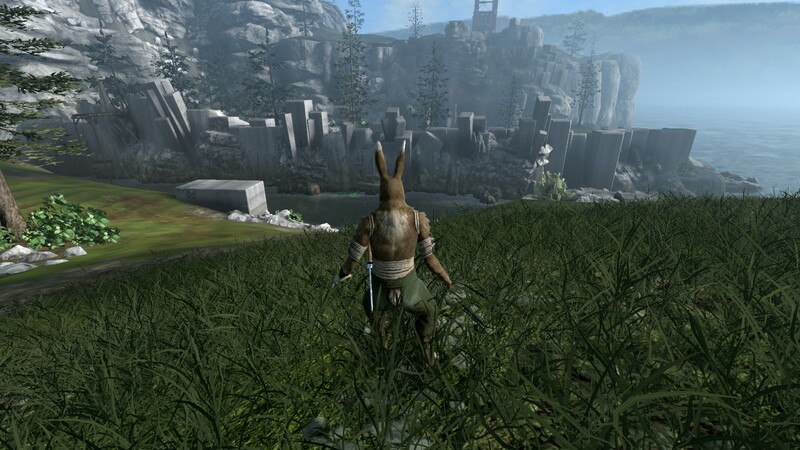 I watched the map editor demonstration and its accompanying humour eight years ago and found it deeply inspiring for my work; I ended up buying Overgrowth in its early access stage to support the development as a bit of thanks in 2013, after I had successfully defended my undergraduate thesis. After pushing through into North Kyrat, Ajay liberates the remainder of the provinces and ultimately is made to choose to make Amita or Sabal the leader of the Golden Path. In my playthough, I ended up choosing Amita and shot Sabal. In a titanic assault on Pegan Min’s stronghold, the Golden Path are successful in toppling his regime. Finding Pagan Min, Ajay learns of his family history, and Min allows him to place his mother’s ashes inside a shrine. Min leaves on a helicopter, leaving Kyrat to Ajay. 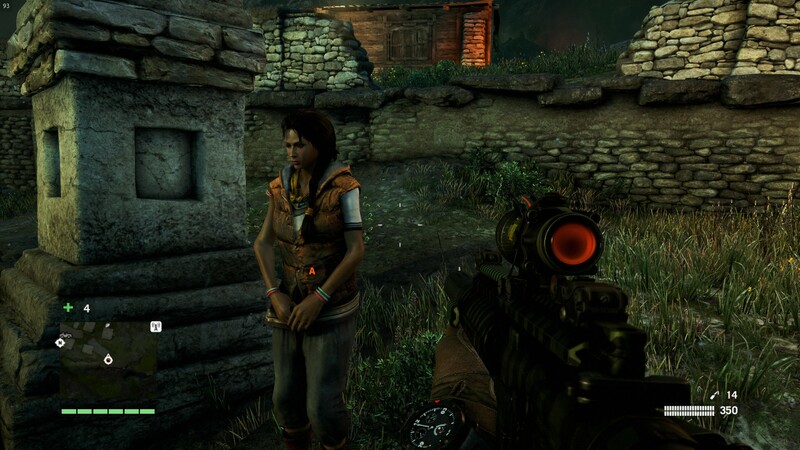 With Amita in control, Kyrat becomes a drug state. Had I opted to go with Sabal’s ending, he would have turned the nation into a theocracy. Regardless of which ending one chooses, the ramifications are less than optimal – this is the core lesson in Far Cry 4, that regime changes very nearly always have unforeseen consequences owing to the complexity of even the more disagreeable political systems. 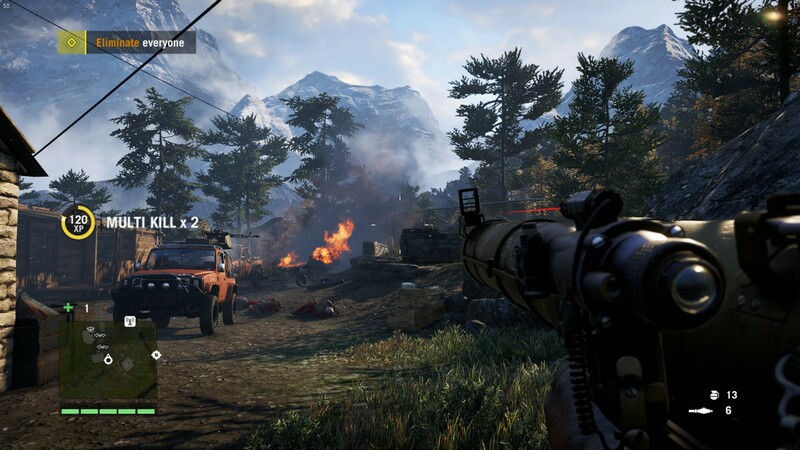 Far Cry 4 thus becomes a thought experiment to illustrate what might happen when one is given the means to destablise a regime and introduce change through force of arms, bypassing activism and protest in favour of violence. While Ajay is given enough background to make decisions and carry out his actions, the constraints result in Kyrat being oppressed by a new regime. In my case, having chosen Amita to lead the Golden Path, Kyrat’s citizens are now entangled in the production of narcotics, which will create problems for other nations, as well as internally. A leadership under Sabal would see oppression of at least a similar calibre to Pegan Min’s rule: given that we know what the outcomes are now, it might have been preferable to leave Pegan Min in control because at the very least, what to expect from his regime is known. 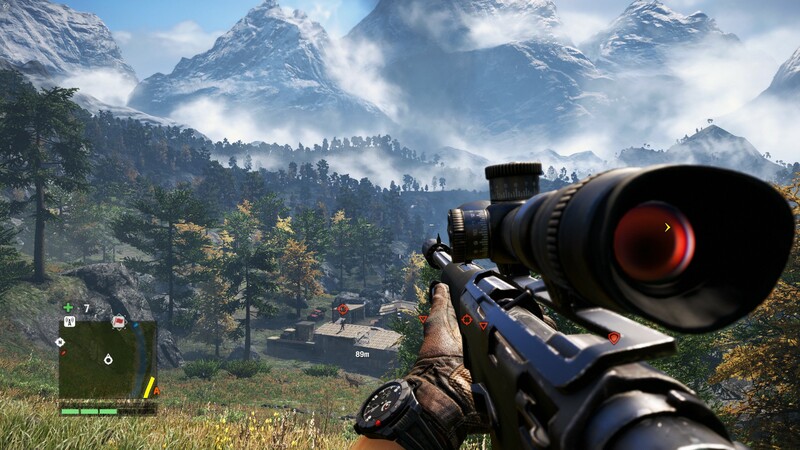 At the end of Far Cry 4, the game succeeds in conveying the message that supporting a cause to bring about change, without full awareness of what that cause is trying to accomplish, may result in system equally or more undesirable than what was already present. 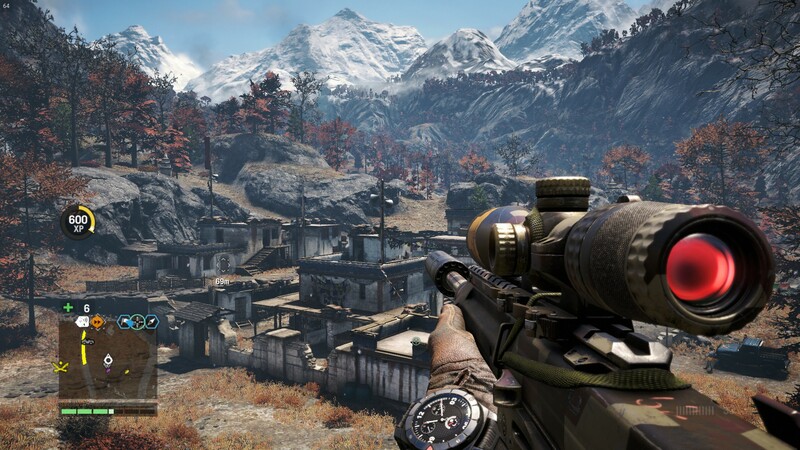 The events of Far Cry 4 provide players an opportunity to experience a war from the perspective of someone who has the capability to make a tangible impact, and the endings warn players that it is possible that, when folks supporting a cause achieve what they’d set out to accomplish, the end result may not be what they were expecting. 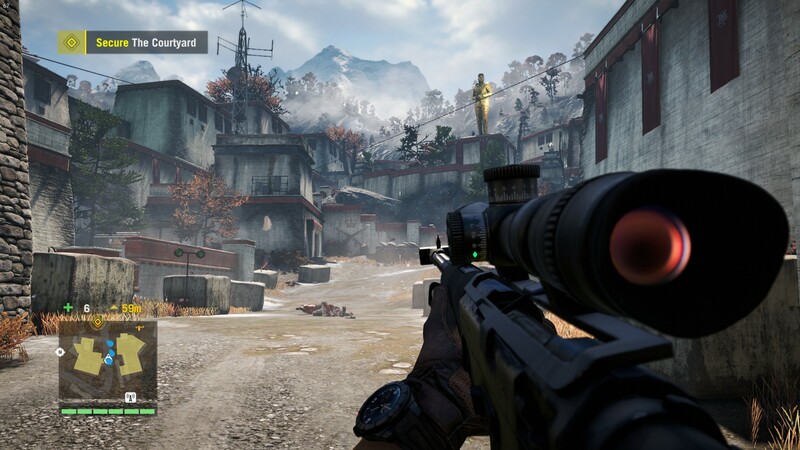 The setting and thematic elements of Far Cry 4 give the impression that the game is another perspective of the Tibet 2008 uprisings, deliberately coinciding with the Beijing 2008 Summer Games. Ubisoft gives power to the player, acting as an external third party who is free to explore Kyrat as they will and do as they choose. 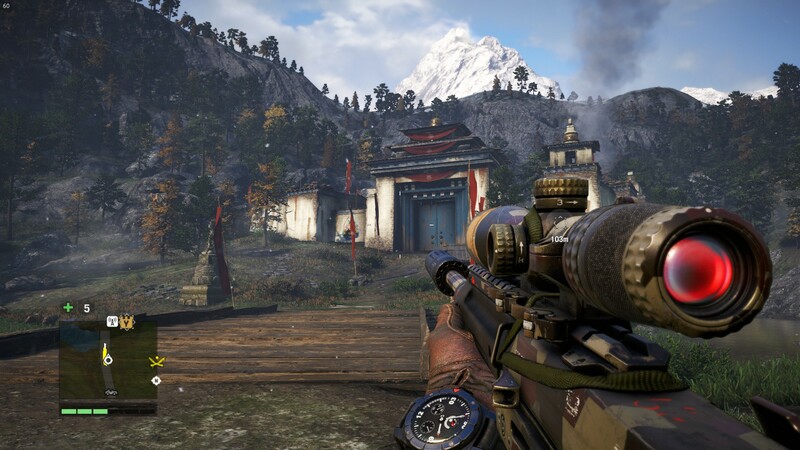 By shifting power into the players’ hands, Far Cry 4 imagines a scenario where that the folks supportive of the complete and total removal of the Chinese presence in Tibet are given the means to do so. As players move through Kyrat and whittle away Pegan Min’s power, the authoritarian regime weakens and crumbles. However, the end result was rather undesirable: Kyrat’s residents end up trading one hell for another. 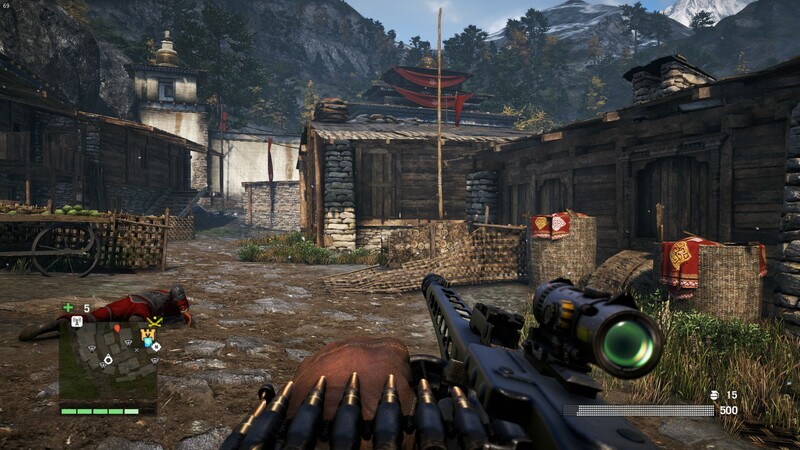 Far Cry 4 thus suggests that, had the Tibet Uprising accomplished its goals of removing the Chinese presence, they might have encountered additional difficulties afterwards – there is no guarantee that the new leadership would bring about the change that people sought, and that a third party intervening may simply create more problems. 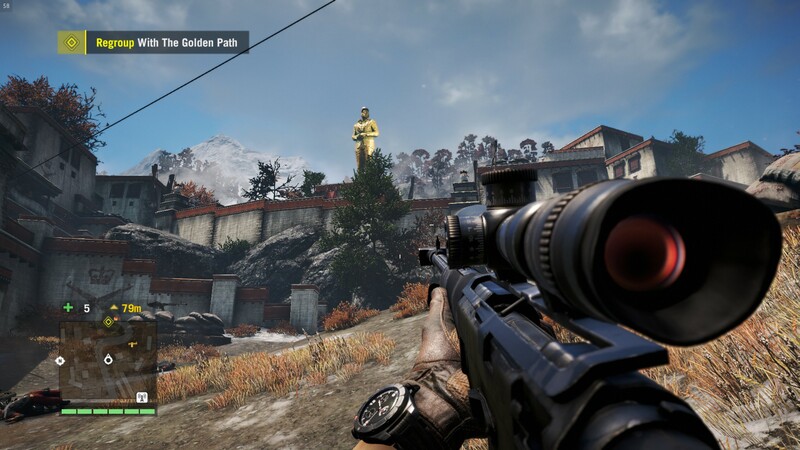 The parallels bring to mind organisations that conducted a widespread campaign to promote an independent Tibet during the 2008, and through its narrative, Far Cry 4 implies that organisations or groups could be doing more harm than good, if they are not fully aware of the consequences of rapid change and nonetheless continue to push their agendas forward. 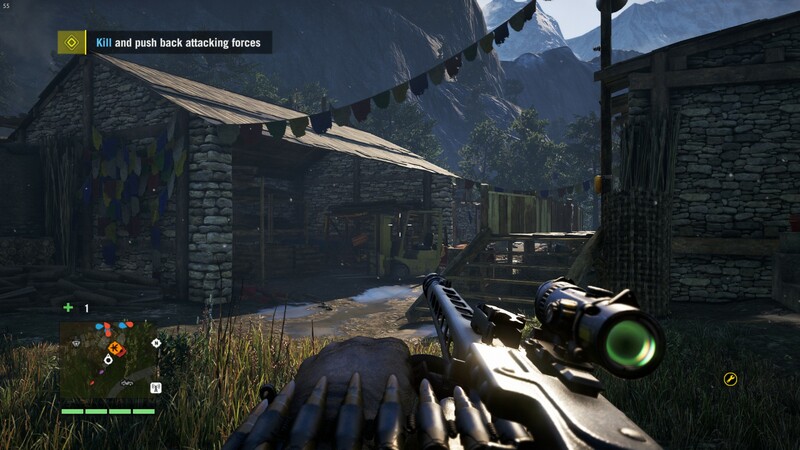 The Buzzsaw is a signature MG42 that has double the ammunition capacity of a standard MG42 with the extended magazine, and coupled with its pointpoint accuracy and high damage resulting from the 7.92×57mm Mauser rounds, the mere fact that I have the weapon means that for all intents and purposes, I’ve beaten Far Cry 4. The weapon will kill all enemies in less than three rounds, can rip ground vehicles and helicopters apart in seconds and even force the largest of wildlife to yield. 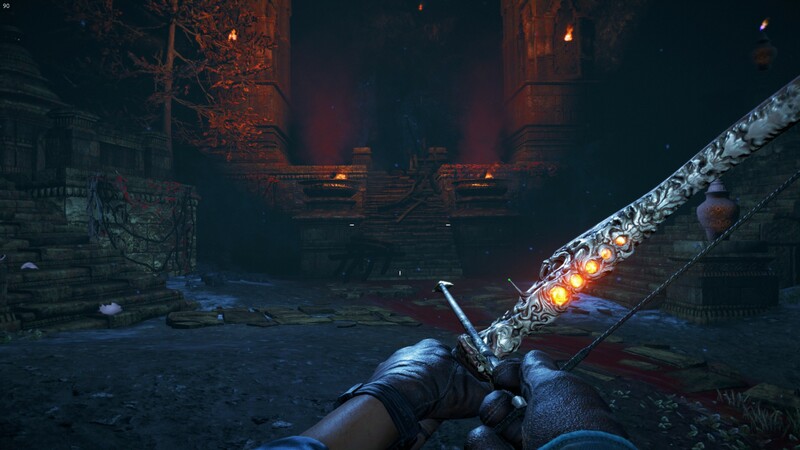 Unlocked after liberating all of the Belltowers, the Buzzsaw is so powerful that there is no game to play: Ajay can clear out entire outposts without ever reloading, and reinforcements sent to support Royal Guard soldiers become victims of the weapon. To balance the Buzzsaw out, it would have been more appropriate to give the weapon increased recoil so it cannot be fired for sustained periods of time on full automatic. This way, other LMGs could be given superior automatic fire accuracy and make them more useful. Of course, things are what they are, and having the Buzzsaw made many missions trivially easy. Most of these screenshots for my second Far Cry 4 post date between late August and November of last year – I was pushing to finish Far Cry 4 towards the end of 2017 so I could begin Wolfenstein II: The New Colossus and The Division. 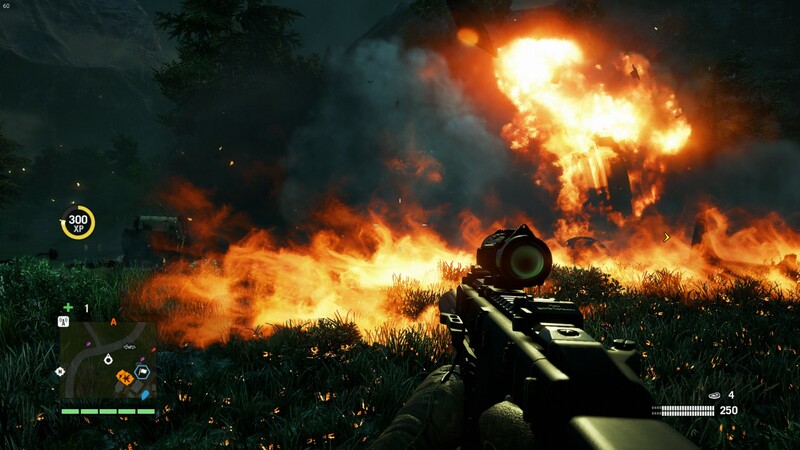 I previously mentioned that vegetation can be set ablaze with any incendiary weapon or even the repair tool. I recall an evening where I spent running around Kyrat, lighting up Royal Guard soldiers with the repair tool and setting them on fire for comedy. Repair tool kills have been something I’ve not made a point of getting since the days of Battlefield 3, where it was bloody hilarious to force a reaction from other players who were killed by the repair torch. In Battlefield 1, the Kolibri is the equivalent weapon for humiliating other players. Here, I run with the Kriss Vector, one of my favourite weapons in The Division: I’ve outfitted the Vector with a similar configuration here that I felt I would most likely run with in The Division (at the time, I did not have The Division), mounting the medium range optics in conjunction with a suppressor. While a fun weapon to use against groups of lightly-armoured opponents, the Vector is stymied by a lower range, and is not as versatile as an assault rifle in Far Cry 4, so I did not run with the Vector with any great frequency during the main missions. By this point in Far Cry 4, I accumulated enough cash to buy all of the weapons and their signature counterparts. 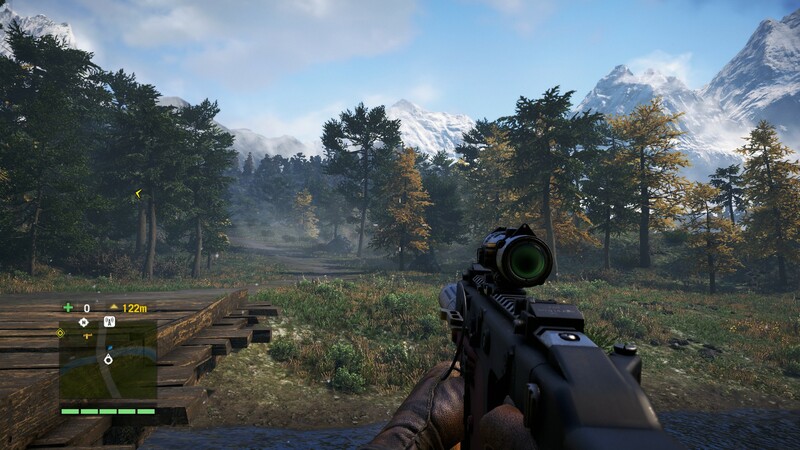 Having good weapons makes the mid and late game a far cry from what things were at the beginning: while the basic AKM was a weak weapon with poor accuracy, having access to the full spectrum of guns in Far Cry 4 made the game much easier to play. Stealth operations became straightforwards to perform, and in a stand-up firefight, all enemies fell before the might of the Buzzsaw. 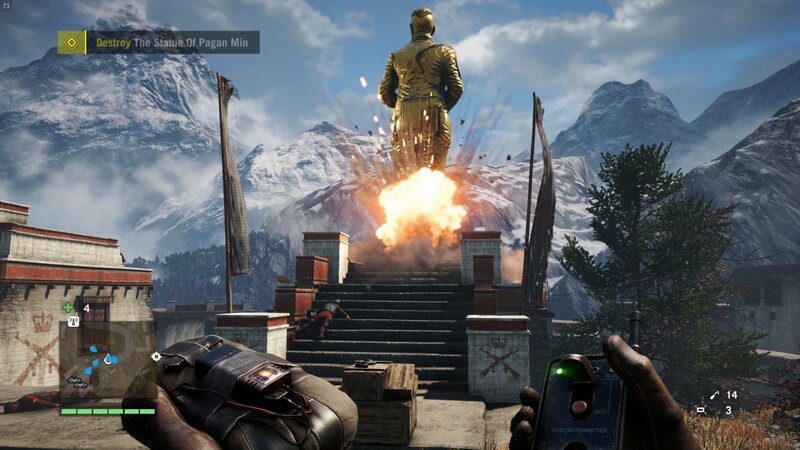 I realise that this post comes a ways later than expected: I beat Far Cry 4 back in early November prior to starting my journey in Wolfenstein II: The New Colossus, and remark that I actually began my journey in Far Cry 4 on Christmas Day in 2016. During Christmas Day of 2017, I pushed further into Wolfire’s Overgrowth, and finished the game; the campaign is a bit short but quite fun. The fighting mechanics are solid and satisfying, and having beat the Overgrowth campaign, I will aim to get a post out for the game at some point in the future. After finishing all of the Longinus missions, players unlock the LK-1018, which can fire laser-guided rockets similar to the rocket launcher of Half-Life 2. More powerful and effective against air vehicles than the RPG, I ended up using this weapon only when free-roaming the world: on missions where my goal was simply to finish them, the Buzzsaw and AMR are superior anti-vehicle options. 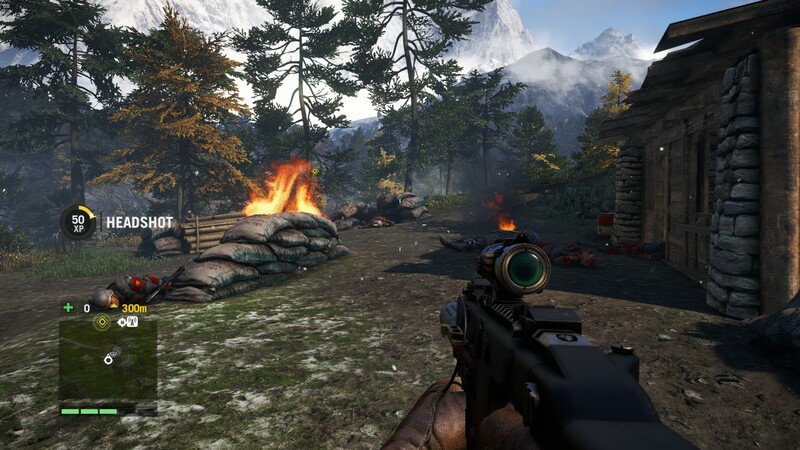 I chose to write about Far Cry 4 now, rather than earlier because of the fact that we’re very nearly about to see Far Cry 5‘s release on March 27. Having taken a look at the system requirements, I’m a bit surprised that Far Cry 5 can in fact run on my current computer on acceptable settings – I’m a 1080p60 gamer, and this requires an Intel i5 clocked at 3.4 GHz, a GTX 970 and 8 GB of RAM. The requirements aren’t too steep at all, and I might just pick the title up as a summer shooter: history suggests that Far Cry 5 might just see a 20 percent discount during the summer sale. 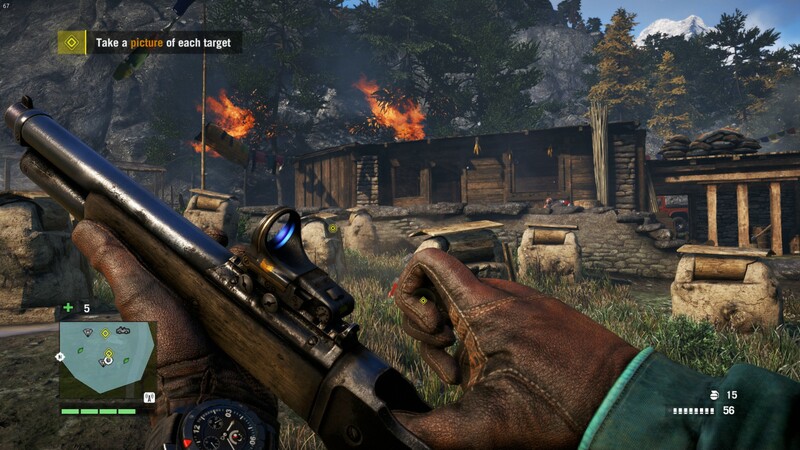 For 56 CAD three months after the launch date, Far Cry 5 could be well worth the price of admissions if Far Cry 4 was anything to go by: overall, I put in 48 hours into Far Cry 4, and ended up with a 80 percent completion rate, so if I were to spend a few more hours, I could probably wholly do everything in the game. My metrics for determining whether or not a pricey Triple-A title is worth it is whether or not the game costs six dollars per hour or less, which is roughly what it costs to watch a movie. 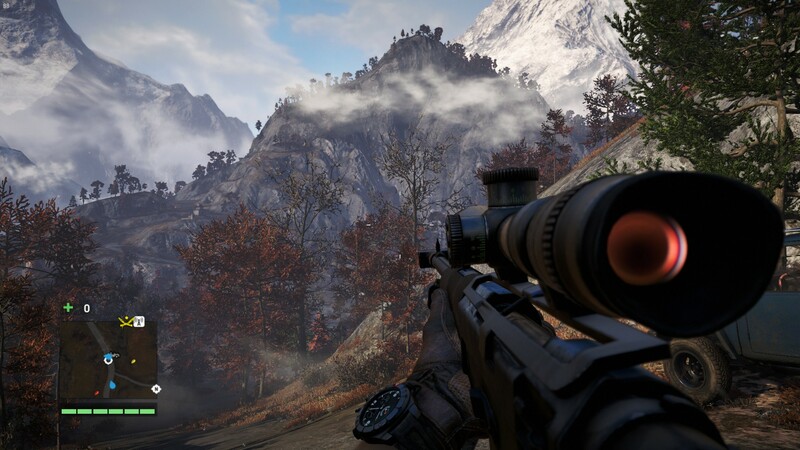 The AMR (Anti-Materiel Rifle) is the ultimate single-action rifle in Far Cry 4: being the signature form of the Z93, the AMR inherits the exceptional damage and slow rate of fire of the Z93, while introducing a HEIAP (High-Explosive Incendiary/Armour Piercing) round that can make short work of anything. Vehicles explode when shot, while large game are so grievously damaged that skins cannot be recovered from them. The main downside to the AMR is that as a signature weapon, it cannot be outfitted with a suppressor, limiting its effectiveness in a long-range role. 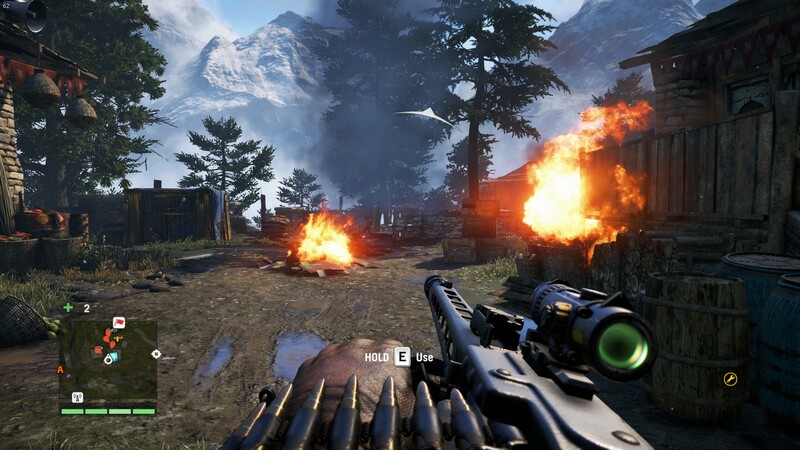 I’m not particularly fond of shotguns in Far Cry 4, since they do not always guarantee a one-hit kill on enemies. 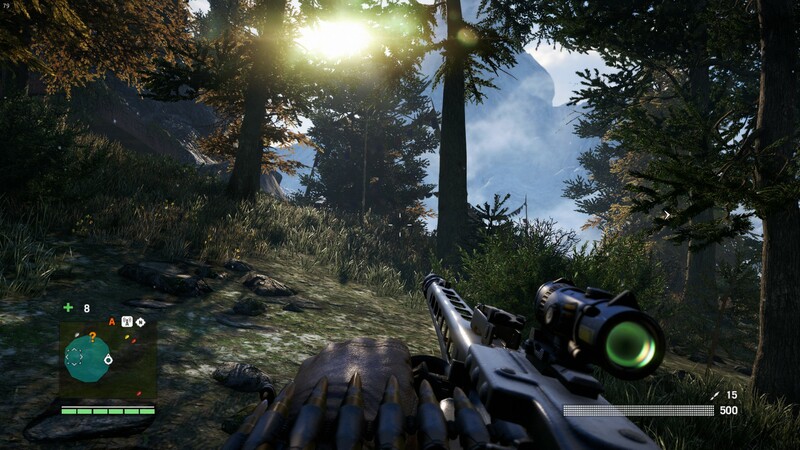 However, there are some missions that require one to kill HVTs or wildlife with specific weapons, which encourages players to try new weapons and make use of novel strategies to make these weapons work. I normally pick off all of the guards in an area from afar, before attempting to finish off the HVTs using the required weapon. 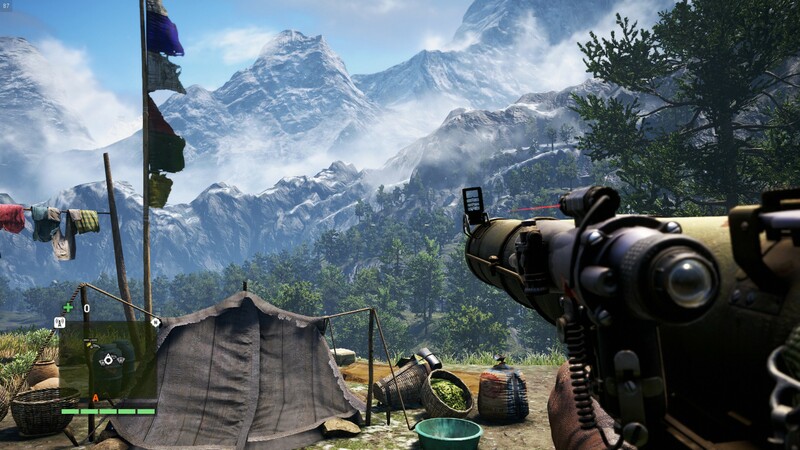 There are a few points in Far Cry 4 where Ajay either falls under the influence or where the narrative slips into an alternative plane known as Shangri-La, a mythical land where the gameplay mechanics are completely different. They’re quite distinct and memorable for their unique designs, but overall, I did not end up playing through all of the Shangri-La missions, only doing enough of them to unlock all of the weapons. In the end, the best long-range weapon is the semi-automatic SA-50, which, while having a lower damage per shot compared to the AMR, offers a much higher firing rate and can be customised. This means a suppressor can be added to the weapon, making it the perfect choice for clearing out fortresses and outposts without alerting anyone to my presence. Clearing outposts without being detected and without any alarms being set off provide experience bonuses, and while players initially must choose between defensive and offensive upgrades, completing the game will allow Ajay to unlock more or less everything. With every available skill unlocked in Far Cry 4, Ajay can survive three times as much punishment, move faster, reload more efficiently, perform more powerful takedowns, carry more gear and so on. 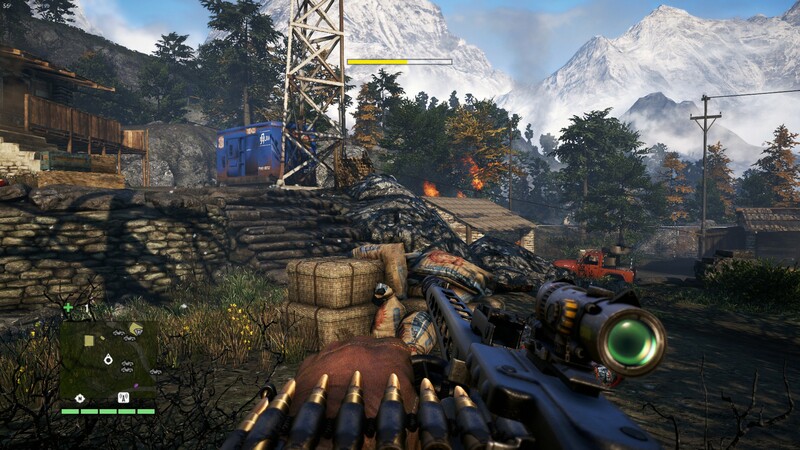 While Ajay was quite weak as Far Cry 4 begins, at the game’s conclusion, the skills, weapons and player familiarity with the perks allow Ajay to be a veritable one-man army. Even the superior Royal Guard of North Kyrat stand little chance against Ajay. I’ve not been too fond of the bows for their projectile drop and low firing rates, so I never made extensive use of these weapons for stealth or hunting. 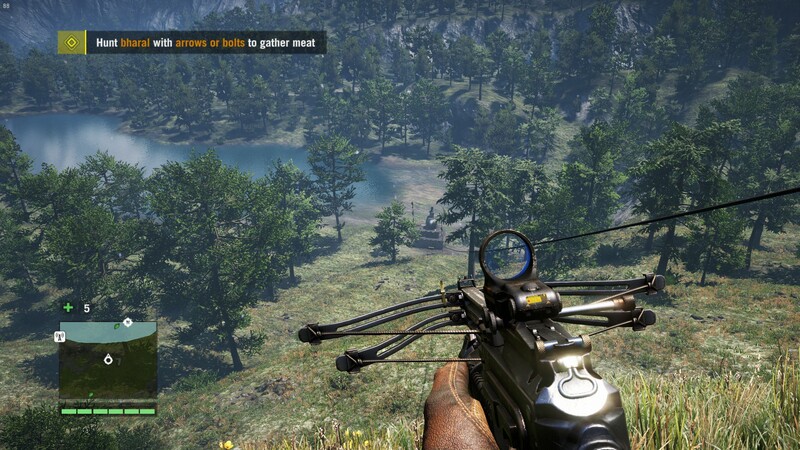 By comparison, the automatic crossbow is easy to use, featuring a high projectile speed and firing rate: it is perfect for close-quarters stealth engagements with multiple targets and the ideal hunting weapon, swiftly dealing with wildlife without damaging their skins. Where stealth is necessary, the automatic crossbow is the top sidearm for the job, and I found myself switching to this from the M79. While most of Kyrat has a verdant, vibrant landscape, some parts of North Kyrat have a more distinct feel to it, with browning vegetation that evokes a sense of autumn. It is here that Kyrat’s toughest enemies are faced, and I take a few moments to look back ten years ago today, which was when an anti-China rally was set to go forwards. Some of my classmates were ardently trying to encourage fellow students to participate in rallies downtown in front of the Chinese Consulate to protest the Chinese government’s response to events in Tibet during the 2008 Summer Games. I antagonised them by declining to participate, feeling that it was unreasonable to expect that immediate change was realistic, and that all actions required consideration to avoid the sort of thing that might arise in Far Cry 4. The argument devolved very rapidly; while I attempted to present the arguments outlined in this post as the basis for why I would not commit to their protest, one of the individuals backing the other party immediately resorted to ad hominem attacks. Claiming that “some of the things [that I] have written are incorrect”, and that I “should only respond if [I] want to discuss issues respectfully towards [my] opponent”, they concluded with the demand that I “owe [them] an apology for being inconsiderate to [them]”. The unique situation in Tibet means that what they sought (an immediate and complete removal of the Chinese presence) may have potentially created new social problems that would have not benefited the people in the area: my mere suggestion that change should be gradual if it is to persist was offensive to them. I stress that I am not opposed to the idea of human rights, nor do I hold that China is blameless, but rather, I oppose actions and organisations who are so focused on one goal that they neglect the bigger picture, and the fact that change must be gradual. In the decade that has passed, I remark that the Dalai Lama has stated that his goal to be what is called the Middle Way: rather than full independence, he calls for cooperation and coexistence, understanding that an extreme course of action will similarly have extreme recourse on the people. Consequently, I owe this individual no apology – that change has indeed taken a more gradual, methodical approach shows that I was right, and there is no need to apologise for presenting facts where they used emotion. The individual above asserted that opposing them constituted as harassment, and so, can be seen as being the precursor to the modern-day virtue signallers, folks who play the victim or take offense on the behalf of other groups for the sake of improving their own image. This is an issue that has become more prevalent, and as of late, such groups have protested everything from video game journalism to the so-called Umbrella Revolution in Hong Kong. The former sparked a massive internet war that ended being of little consequence to those seeking to change the industry, and the latter, while ostensibly promoting democracy, created major disturbances in Hong Kong, blocking traffic and damaging property that undermined the movement’s credibility. As a consequence, I believe that Marco Rubio’s nomination of Joshua Wong and the Umbrella Revolution’s participants for a Nobel Peace Prize to be, for the lack of a better word, a complete and utter mockery of what the Nobel Peace Prize to be about. In their actions, the people who participated in the Umbrella Revolution give the demeanour of little more than entitled youth who do not understand what hard work entails. In the knowledge of the unreasonable real estate market in Hong Kong, which makes it difficult for Millennials to buy a house, it is understandable that there is dissent. However, I hold that there are more appropriate ways of expressing this dissatisfaction, as opposed to causing a public disturbance. Positive change in society is built on the shoulders of the hard-working, not the vocal – activism and protesting has its limits compared to sustained hard work and a clear game plan, so I’ll leave the topic aside and return to Far Cry 4. 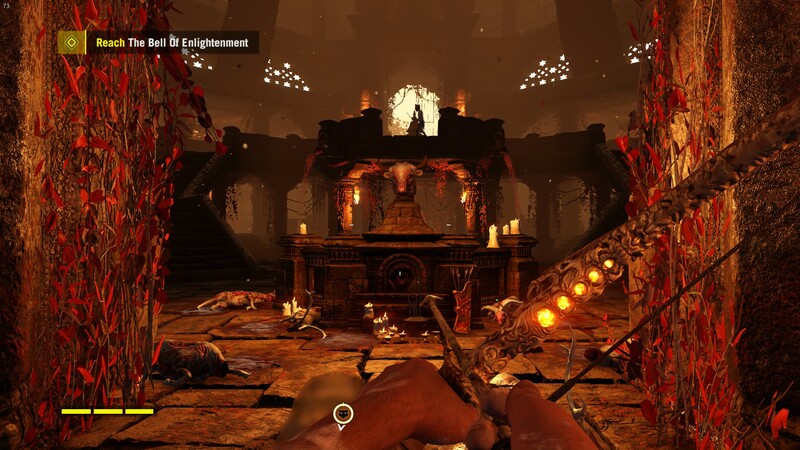 Here is another segment of Far Cry 4 set in Shangri-La: as an ancient warrior, players only have access to an enchanted bow, but also gain a powerful tiger companion. Enemies take the form of mysterious spirits, and these missions allow players to learn more about the mythical aspects of Kyrat. I prefer these missions to the psychedelic, drug-fuelled chaos of the Yogi & Reggie missions, which gave me a headache in trying to complete them. Humourous characters they were, their impact on gameplay was much less enjoyable, and I only did enough of their missions to advance the story. The Shangri-La missions are quite linear in nature, and end with players reaching large bell that they must cut free and allow to toll. The real-world location is a city of 130 000 people in Yunnan Province of China, but when the name is mentioned, James Hilton’s description of a paradise in his novel, Lost Horizon is what comes to mind. In his novel, Shangri-La is a Himalayan paradise far secluded from the world, where the residents were immortal and eternally happy. A glance at some of the beautiful scenery up in the Tibetan Plateau, Sichuan and Yunnan will speak volumes as to why Hilton set his fictional paradise up here. From colourful pools of Huang Long, to the vast salt lakes in the most remote corners of Tibet, the landscape up here is beautiful beyond measure, and one of my dreams is to visit this part of the world for myself. 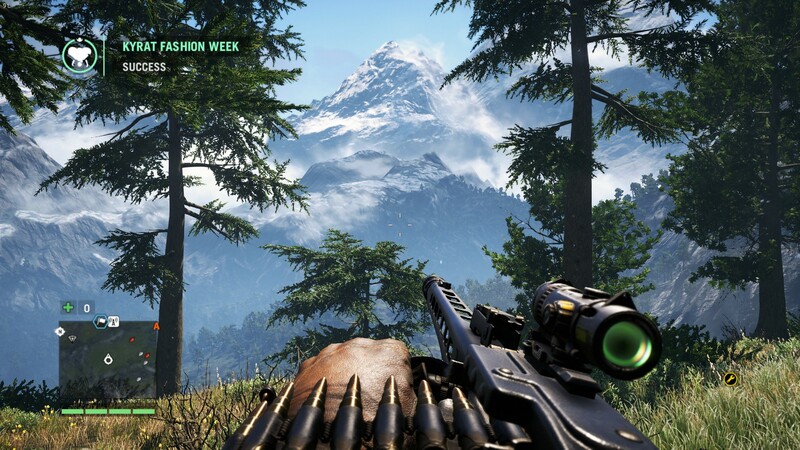 Kyrat features none of these landscapes: its design is more similar to the terrain found in Bhutan, a small nation that reports a very high social development index and happiness despite its status as a least developed country. I ended up choosing Amita’s path for fun: at the end of the day, one’s choice is not particularly relevant, and one of the things I’m wondering about Far Cry 5 is whether or not it will create a more impactful ending based on the decisions that players make. With this being said, the strengths in Far Cry seem to be the exploration component, so even if Far Cry 5 does not have a true user-chosen ending, I’m sure the game itself will be solid from a technical perspective. We come to it at last: the final assault on Pegan Min’s fortress. There’s hardly a need for stealth here: equipping the loudest and most powerful weapons in the game, I accompanied the Golden Path on a full-scale siege of his fortress. With the Buzzsaw, AMR and LK-1018 in my inventory, I struck the facility with guns ablaze and very quickly cleared out all resistance without any difficulty. Golden Path forces will assist Ajay in his siege, but my superior firepower meant that this was quite unnecessary. 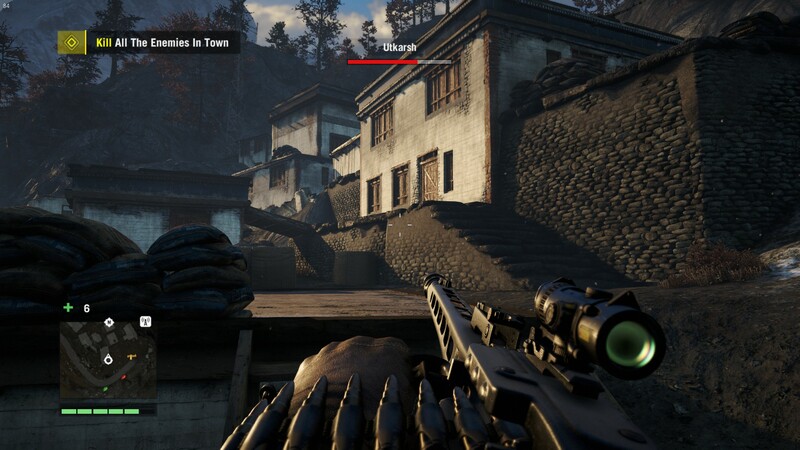 Far Cry 4‘s co-operative component and guns for hire: the latter can be called in to assist with operations to take on liberation of outposts and fortresses, but during my run of the game, I relied on neither to help out. While they could add a bit of amusement to the game, I prefer running missions without computer-controlled NPCs so I can fully control my approach towards completing an objective – there’s always a chance that they might break stealth and set off an alarm prematurely. Officially, my journey in Far Cry 4 ended eleven months after I began the first steps to the campaign back on Christmas Day of 2016. Throughout the summer of 2017, I continued to play through the game with a non-trivial frequency and wondered why I did not play it sooner. 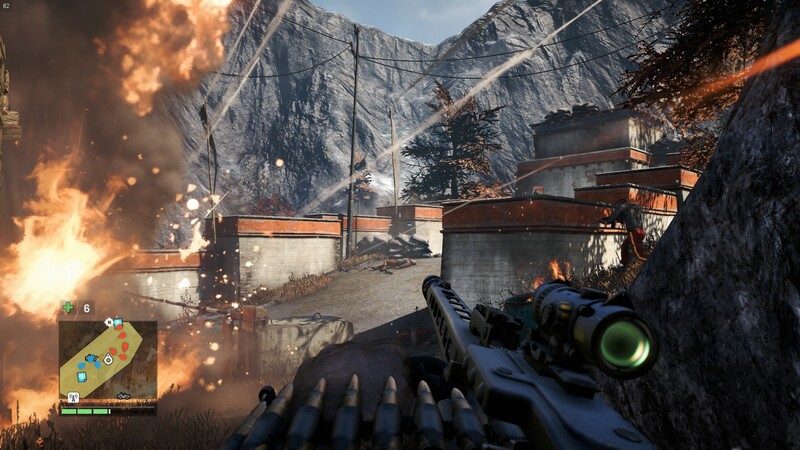 For the most part, Far Cry 4 is superbly enjoyable – there are only a few repetitive elements. Besides the animal hunting missions, I was not a particular fan of the arena mode; I needed to reach rank ten to unlock the Bushman, the best assault rifle in the game, and after I finished this, I continued on my way with the campaign. From a gameplay perspective, Far Cry 4 proved to be remarkably entertaining, and a sobering theme aside, the game itself is actually quite light-hearted and humourous in nature. 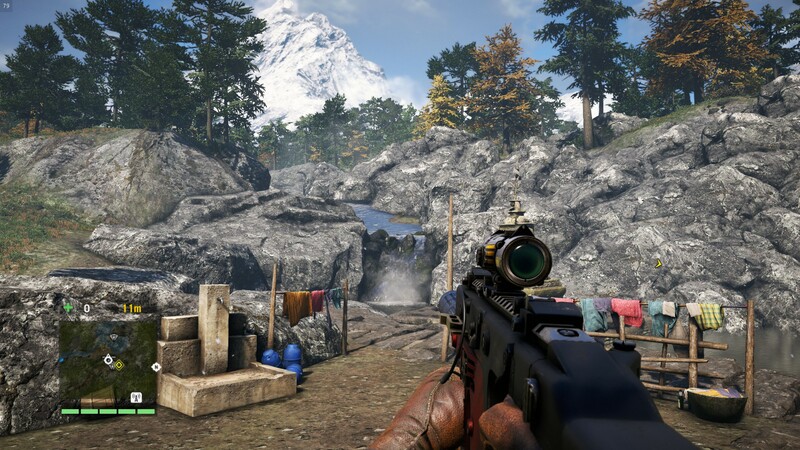 There is no shortage of activities to participate in within Far Cry 4, and the world of Kyrat is fun to explore, even if most of the map is repetitive in design. One of the most notable elements in Far Cry 4 is the fact that Pegan Min’s Royal Guard speak Cantonese; it was hilarious to hear enemies insult my family and demanding that I drop dead. 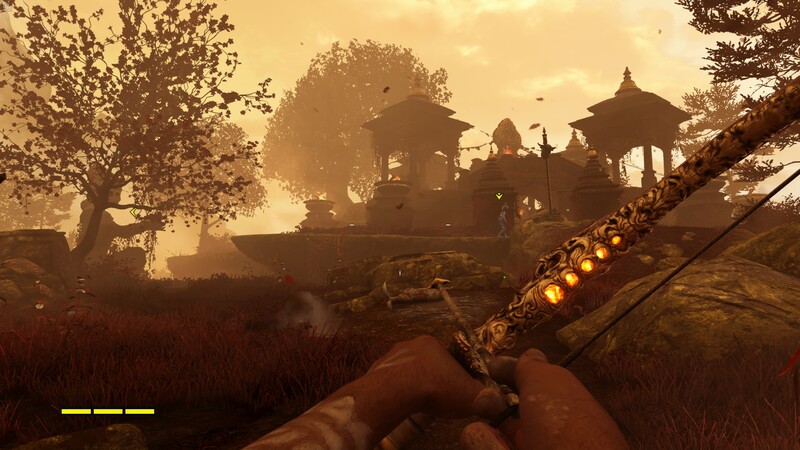 The weapons in Far Cry 4 are also immensely satisfying to use – there is an impressive array of weapons Ajay can equip and use. 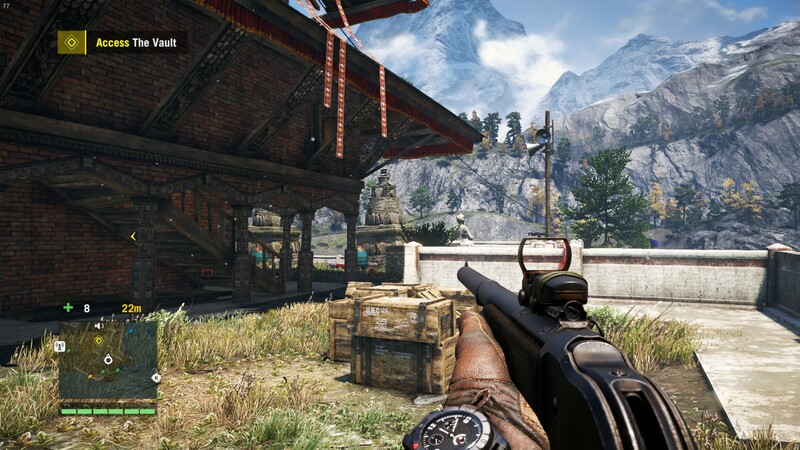 While the gameplay is reasonably straightforwards, Far Cry 4 offers an incredible array of modifiers: from weapon customisation and skills, to syringes that impart benefits, Far Cry 4 allows players to approach any situation in any manner of their choosing. The world-building in Kyrat is also top-tier: from Shangri-La missions to random journal entries and design elements in the environment, Kyrat is highly immersive. All of these gameplay aspects, in conjunction with a narrative relevant to current events, makes Far Cry 4 both entertaining and thought-provoking. The game is very much worth the price of admissions, and also sets the stage for the upcoming Far Cry 5, which is set in Montana – although the core mechanics of Far Cry 5 look similar to those of Far Cry 4, I’m curious to see what a virtual Montana looks like, and the prospect of fighting off a fundamentalist doomsday cult is also enticing. Releasing later this month, I will be keeping an eye on Far Cry 5; if I can run the title, there is a chance that I may pick up Far Cry 5 as a title to experience during those days where the weather is not conducive towards being outside. Gordon Freeman is tasked with retrieving a resistance weapon capable of destroying Combine Citadels in a mission whose timeframe relative to the other events of Half-Life 2 are not known. After arriving at a sawmill, Freeman fights his way through hordes of zombies to reach a derelict mine guarded by a veritable armada of Combine soldiers. 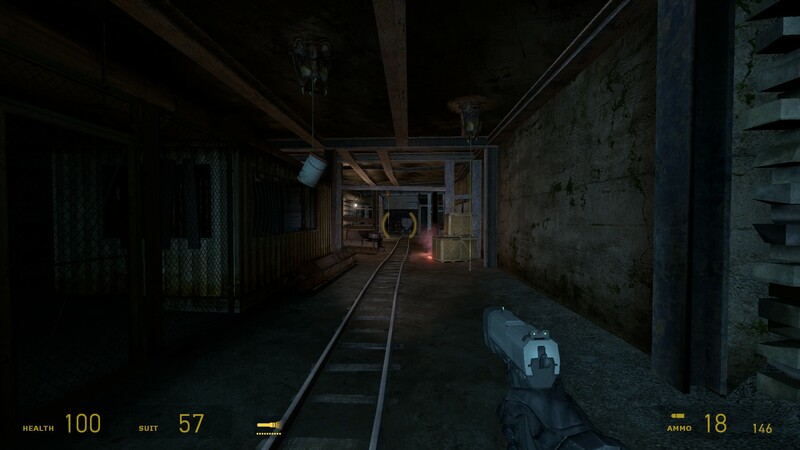 Entering the mine, Freeman begins his descent into the bowels of the earth itself in search of this weapon. Released earlier this year as a Half-Life 2 mod, Downfall is an excellent fan-made addition to the Half-Life 2 universe that remains highly faithful to the mechanics and visuals of the Half-Life 2 games. 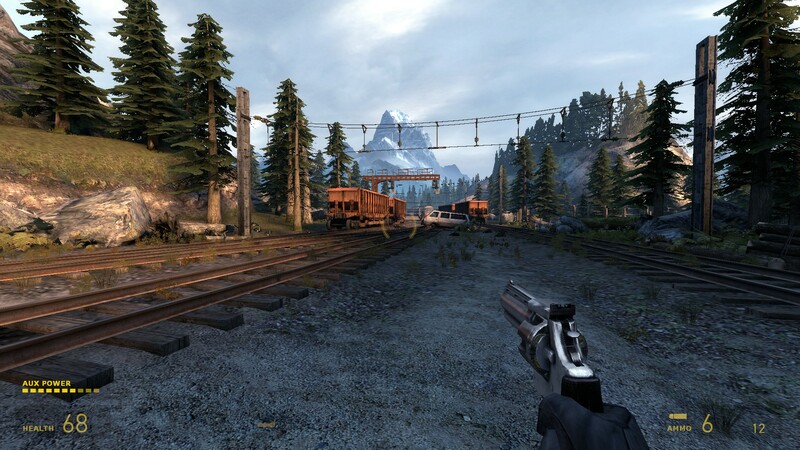 Set in the White Forest area, the atmospherics and visual effects are top-tier, matching those of Half-Life 2 Episode 2 in most areas and surpassing it in others. The mod is incomplete at present, and two more chapters are planned. The first chapter is a ways longer than Half-Life 2: The Lost Coast. The mod is comparable to a single chapter in a Half-Life 2 episode, taking around three-quarters of an hour to beat on standard difficulty, but it’s an immensely thrilling ride, being the next best thing to a proper announcement about the likely non-existent Half-Life 2 Episode 3 and Half-Life 3 itself. 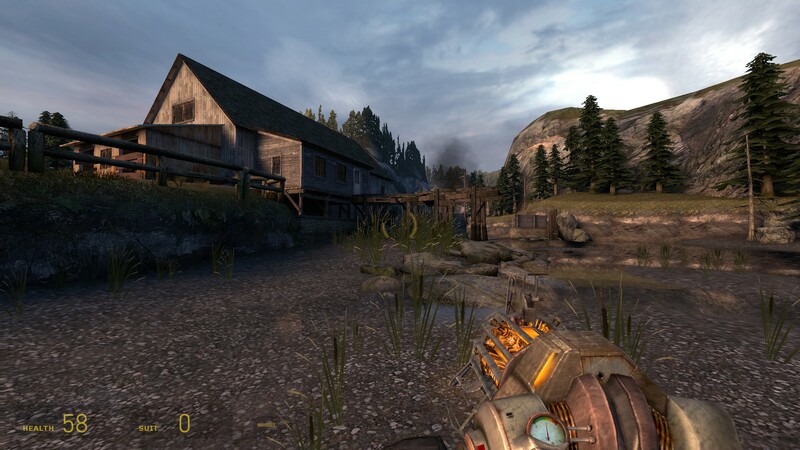 What makes Downfall such an entertaining mod is the fact that, while the level design is structured consistently with what is seen in the actual Half-Life 2 titles, Downfall introduces a new twist on things: players are only equipped with the legendary Zero-Point Energy Manipulation Device (Gravity Gun) to begin with. 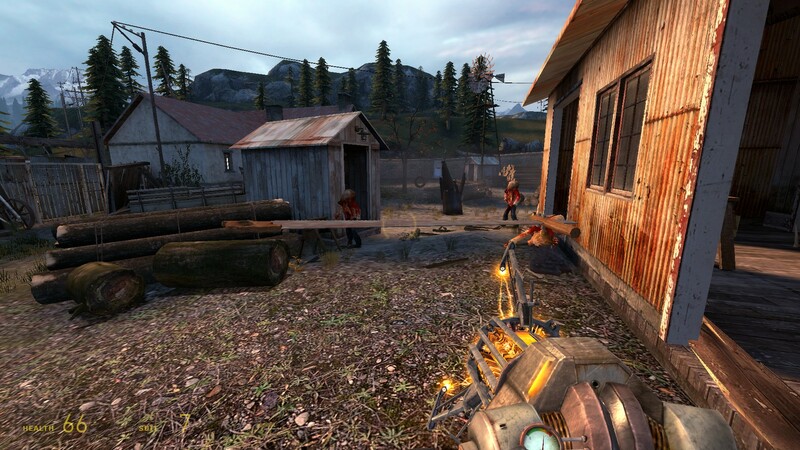 Upon arriving at the sawmill, zombies begin appearing en masse to attack the player, forcing players to get creative with the objects available in the environment. Even after a crowbar is found, things remain quite tricky – clearing an area of zombies and moving onwards is an especially rewarding feeling. One of the more exhilarating moments was fighting a poison headcrab zombie in one of the houses: I’m accustomed to having some heavy firepower in the form of under-barrel grenades and a good stockpile of hand grenades when taking these monstrosities on, but Downfall only provides players with a pistol at this point. Running out of ammunition will occur before one can take down the poison headcrab zombie, so players are forced to bait the zombie into throwing the poison headcrabs at them, and then dispatch each individual poison headcrab with the crowbar. 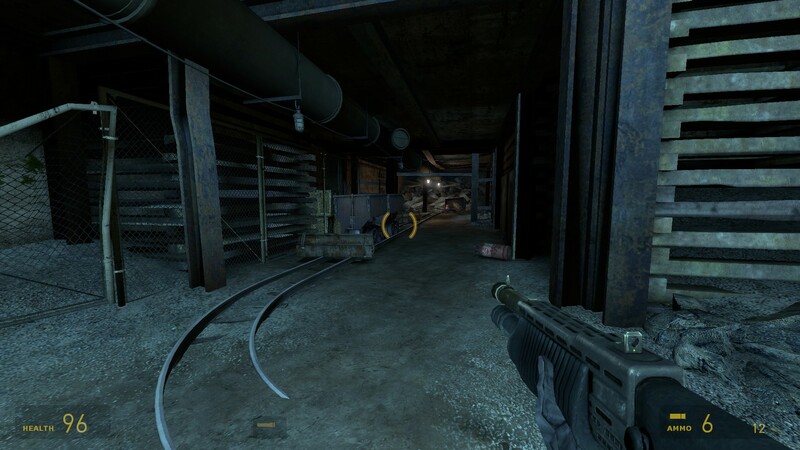 As players acquire more weapons, the gameplay in Downfall begins feeling more like a traditional Half-Life 2 mission; engaging Combine soldiers and other enemies become rather more straightforward. 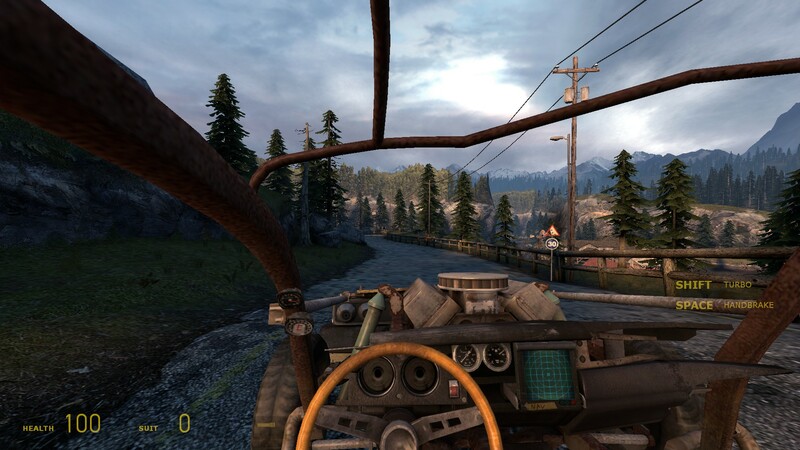 Downfall opens with a casual Sunday drive to a location where a beacon signal is transmitted, under what appears to be the setting sun. Downfall could hypothetically be set in the moments following Episode 2, after Eli Vance is killed by a Combine Advisor; Freeman must then regroup with additional members of the Resistance before they set off for the Borealis. Once players reach the sawmill, the muscle car must be abandoned. There’s a definite calm in the atmosphere as Freeman begins exploring the area, and there’s an abandoned boathouse adjacent to a lake. 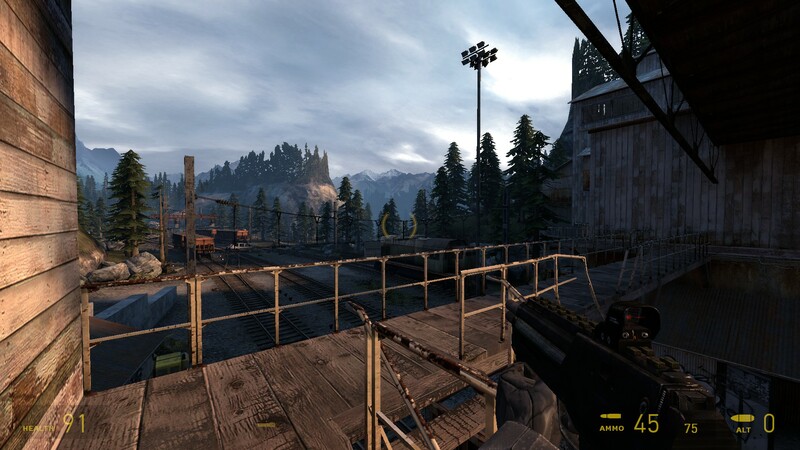 Of all the existing instalments in Half-Life 2, Episode 2 stands out as having some of the most memorable scenery, being set in the remote forests of Eastern Europe rather than the close-quarters of City 17. I’ve heard that Episode 2 was inspired by forests of Oregon. The moody skies in Episode 2 bring to mind the mood of my area shortly after the Great Flood of 2013. The Royal Family visited the area shortly after, and I recall listening to a news programme covering the event while I was fighting my way through the White Forest Inn ambush. The quiet beauty of the area is offset by the fierce onslaught, so after the fighting died down, I spent a few moments exploring the area. 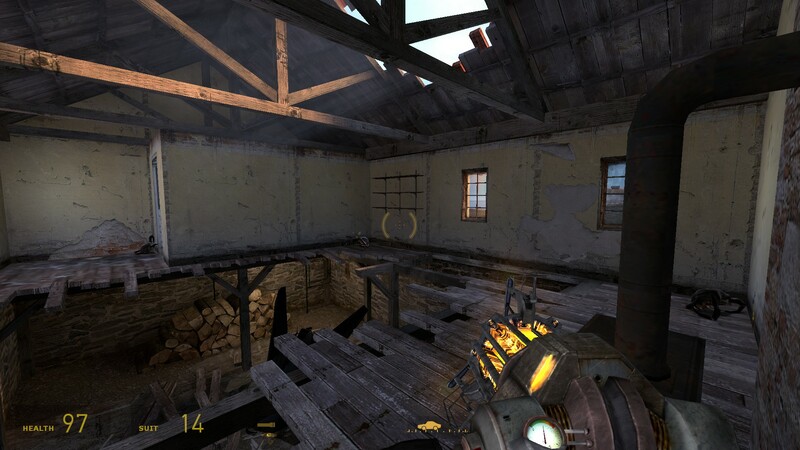 Because players only start out with the Gravity Gun and find a crowbar early into Downfall, the first segments of the mod handle similarly to the Ravenholm mission. 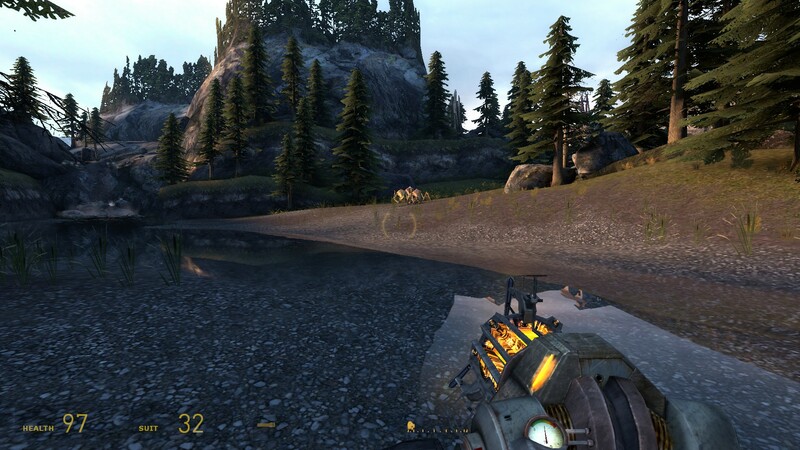 To encourage creative play, Valve implemented an achievement called “Zombie Chopper” for using only using the Gravity Gun. 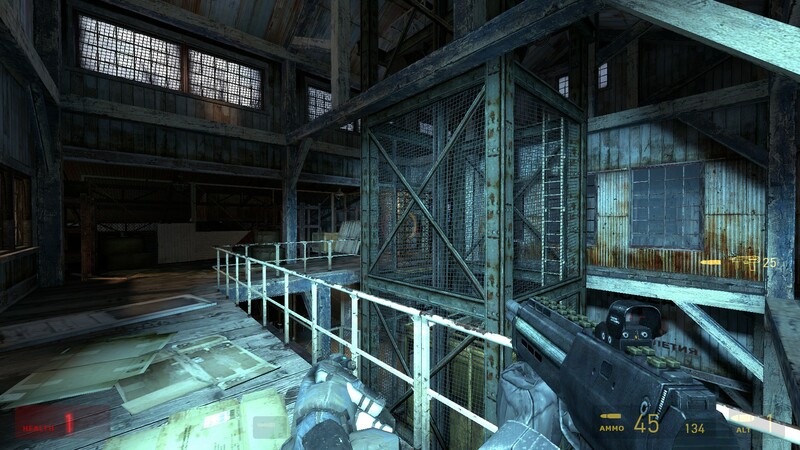 While seemingly a difficult task, ammunition was already quite scarce in Ravenholm, and bullets are actually less effective against zombies than large objects. The crowbar is a fantastic weapon against leaping headcrabs and can kill one in a single hit, including poison headcrabs. A large number of zombies, including zombines, appear here, but the abundance of objects that can be thrown means that there are no shortage of options for dealing with zombies. The tire swing on the left of image can be used to great effect; it is hilarious to send conventional zombies flying with it, but there is also a risk: I lost thirty points of health because the tire swing swung back at me after one use. In the sawmill’s attic, players will come across the control panel for opening the flood gate, allowing Freeman to move into the next area. 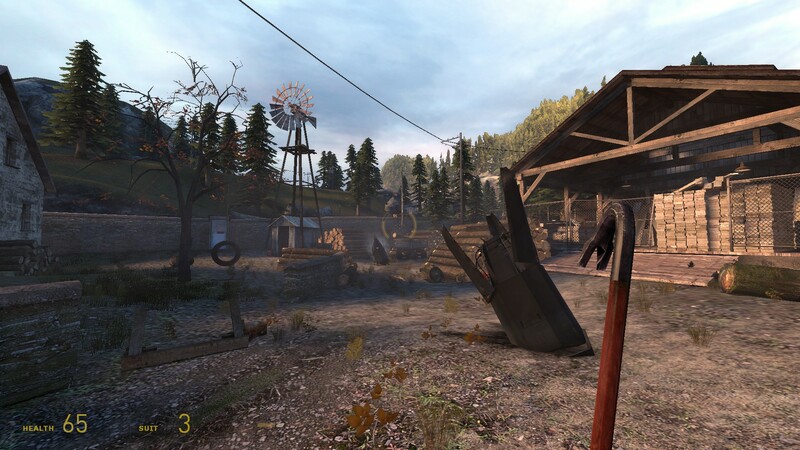 There’s also a large ammunition cache here, plus several computer terminals, indicating that the sawmill was probably used as a Resistance outpost before the Combine overwhelmed them. For the time being, there’s no way to actually get into the ammunition cache, which is present purely for aesthetic purposes. 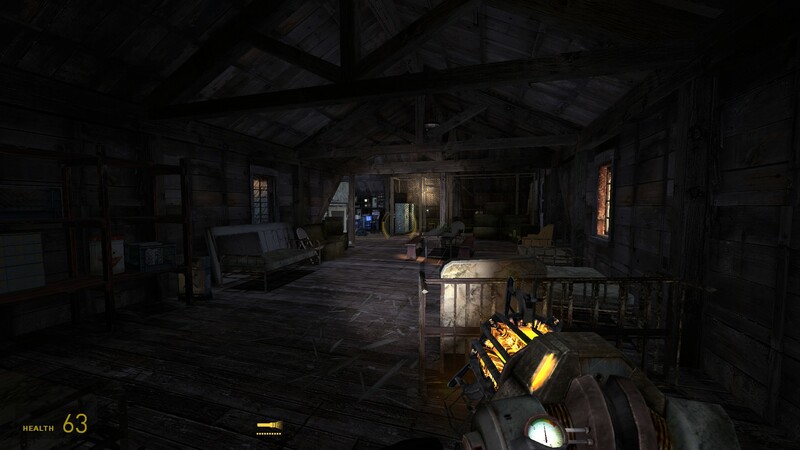 The house here is infested with poison headcrabs and a poison headcrab zombie: while I’m accustomed to using heavy firepower to deal with them (burning them with explosive barrels, or otherwise using a combination of hand grenades and the MP7’s under-barrel grenades), these are not options in the house. Instead, Freeman must bait the poison headcrabs into leaping off the zombie, and then beat them down with the crowbar. After all of the poison headcrabs are expended, the zombie itself can be pummeled to death using physical objects, and the cinder brick found in the cellar of this house is particularly useful for that task. A quick glance at the calendar shows that it’s been five days since Christmas, and six days since I posted anything. This is because it’s been a bit of a relaxing, if somewhat busy Christmas: on Christmas Day this year, the day began with a fantastic breakfast of fried eggs, bacon, hash browns and Belgian waffles. After the opening of gifts, I took a walk on the nearby hills by afternoon despite the -20°C weather, where I found some Christmas ornaments hanging on one of the aspen groves, and then spent the rest of the day playing Overgrowth. We finished the day with prime rib and the remarkably flavourful beef bones. On Boxing Day, I stepped out into the frigid weather to capitalise on Boxing Day sales; this year, my wishlist was a simple one, and I picked up Smithsonian Earth for a third off. The cold weather has since persisted, and on Thursday, I decided to venture into the mountains one more time before the complimentary park pass expired. While the original aim had been to watch a winter sunset, the weather had other plans and blanketed the area in white. On the shores of mountain lakes distant, the world was completely silent and still. The drive up to these remote lakes was preceded by a delicious and warm crab and asparagus omelette with a hot chocolate at Melissa’s Missteak, which was easily the most colourful part of the day. They definitely aren’t kidding when the say that the Icefields Parkway is a remote stretch of road with reduced maintenance in winter. The drive back home was as treacherous: a blizzard had began in earnest when we began making our way back. Last evening, temperatures reached a low of -31°C before windchill and a fresh snow had fallen. It’s expected to be -32°C later tonight (-43°C with windchill), making me extremely appreciative of being able to rest in a warm place. I’m sure readers are not here about the cold, so we’ll return to Downfall, where the mines are warm, even if inhabited by barnacles. 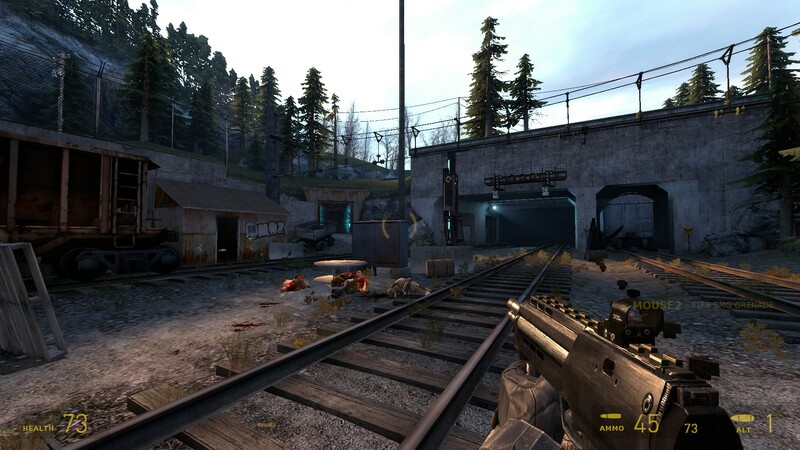 Upon exiting the first of the mines, Freeman comes across a rail line covered by a Combine Sniper. 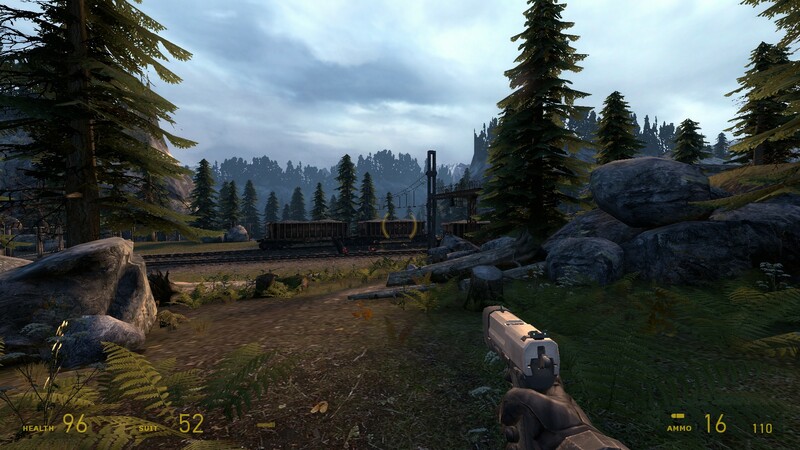 There’s practically no cover leading down the tracks, and while there is another path that allows Freeman to close the distance between him and the sniper, I chose to make use of a log and well-known limitation in the AI to close the distance more quickly. The sniper will throw back the first grenade, but will not do anything about the second grenade Freeman throws at them. The Colt Python pistol, for all of its incredible power, is constrained by a small ammunition pool, and I’ve typically not run into situations where I’ve required it. It’s best saved for Combine elite soldiers and Hunters; in Downfall, these enemies do not appear and so, it can be used to quickly deal with the first wave of Combine soldiers Freeman encounters. Here, I look back at the train tracks and the scenery. With the sniper now cleared out, I take a look around at the setting and marvel at the details of the mining structures. 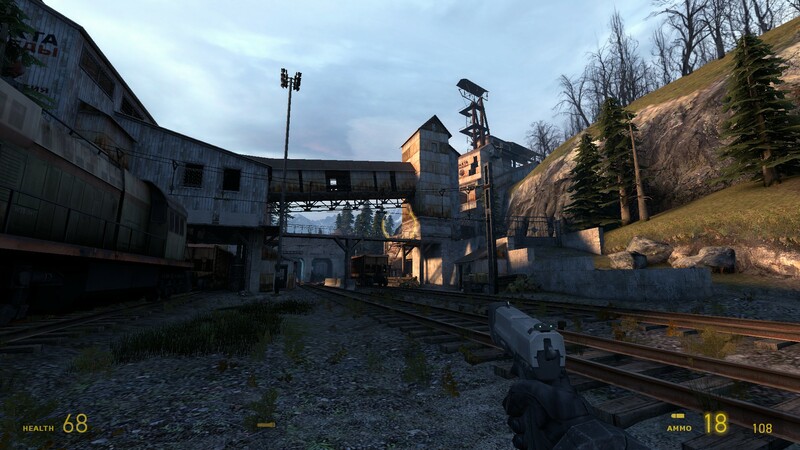 This mine forms the setting for the only firefight against Combine soldiers in Downfall, and while players are armed with only the pistols at this point, use of cover and a little bit of creativity will allow for the first wave of soldiers to be cleared out in a relatively straightforward manner. I finally acquire the MP7, which is probably my most-used weapon in all of Half-Life 2 and its episodes simply because of how plentiful ammunition for it is. The weapon is used extensively by Combine, and ammunition crates for the weapon are easily found. While ineffectual at longer ranges owing to its spread, its large magazine capacity and carrying capacity makes it a solid all-around weapon for most close range engagements. 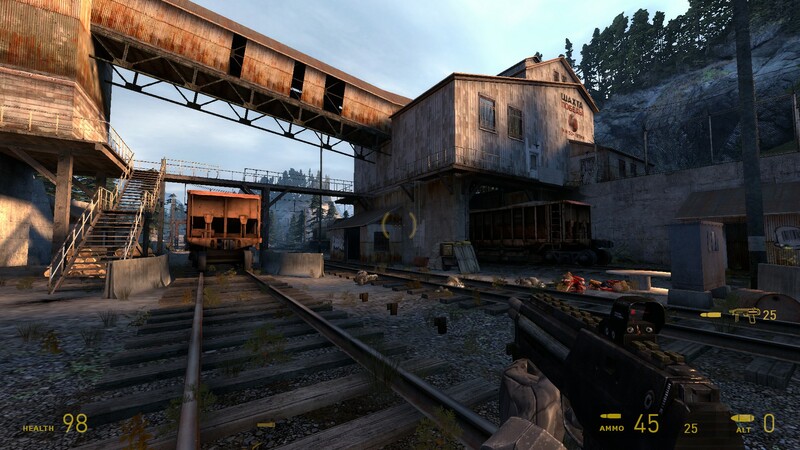 I cannot quite put my finger on what it is about the lighting and assets that give Episode 2 environments such a unique feel to them, but overall, the presence of open wilderness as opposed to urban build-up meant that, had Half-Life 2 Episode 3 ever come out, I would have been hoping for more rural settings. With the story hypothetically set to take place in the arctic, it seems that players would have had the chance to explore non-urban settings. There’s a restrictor here that keeps the Antlions away. These insect-like aliens can spawn indefinitely and overwhelm players with their numbers, but they can be kicked back using the gravity gun. Enough hits from the gravity gun will kill them, although their numbers makes the technique viable only with solitary antlions. The elevator here leads to the control room with the energy orb powering the Combine defenses here, and disabling it will lower the force field covering the path Freeman needs to take. Antlions begin swarming the area, although now that Freeman’s got the MP7 and SPAS-12 Shotgun, taking them on becomes a bit more straightforwards. While there’s been no official news of Episode 3, some dedicated folks have begun working on an unofficial continuation using the Unreal 4 Engine, which powered my Master’s Thesis project. This continuation, titled “Project Borealis”, is being undertaken to build a game from the story that Marc Laidlaw provided back in August, outlining what Episode 3 would have entailed. The project’s lead manager has industry experience and seeks to create the best possible experience for fans of the series and presently, the story is around half finished. Some interesting concept art has also been provided for Arctic headcrabs and a new model of Strider. Enemy AI and weapon concepts are also entering testing; while no news of when Project Borealis’ release was provided, the team did mention that they will be keeping the community updated as they continue with the project. This is quite exciting, and it seems that, even if Valve has no interest in continuing the Half-Life franchise, dedicated and devoted community members can and will keep things going. I’m curious to see where things will end up, and with the Unreal 4 Engine driving things, the game could look quite refreshed once completed. After entering the main mine shaft and descending deep underground, Downfall comes to a close. The bitterly cold winter evening is upon us, and after a warm dinner of fried chicken, I’m watching the mercury plummet. The weather is expected to warm up as we enter the New Year; before 2018 sets in, I’ve got one final post for 2017, dealing with Nekopara‘s OVA. 2017’s been a bit of an interesting year for the blog, and while I can’t say that my numbers are particularly strong a motivator for continuing this blog, a strong reader-base and the associated discussion means I’m not quite ready to call it quits fully yet. It typifies Valve’s ability to create suspense and horror in games whose aim is not solely horror, and Downfall makes excellent use of Valve’s techniques to create a mod that feels as though it is a proper instalment in the Half-Life 2 universe. 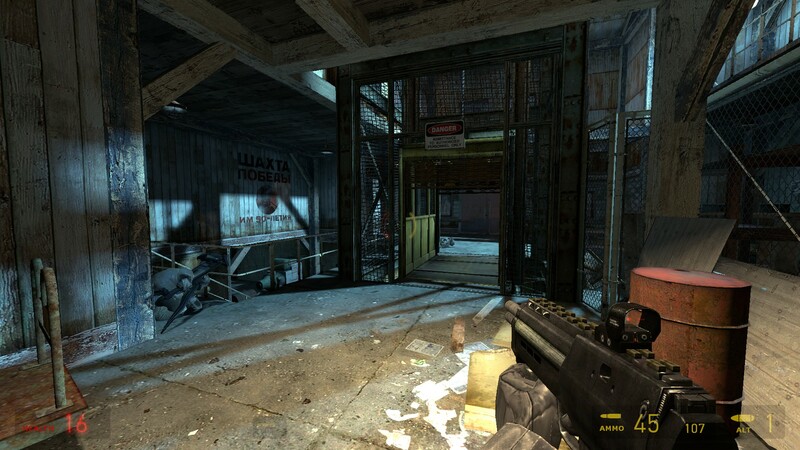 While faithful to Half-Life 2 in design and concept, subtleties in the gameplay show that there remains some room for improvement still: besides cleverly forcing players to adopt different strategies, there are other minor surprises in store for players, with the most notable being the Combine Sniper that returns a grenade players throw at them, requiring players use a second grenade to defeat the sniper. This moment was completely unexpected and shows that the Source Engine, in spite of its age, can still be made to throw off players to create refreshing moments. 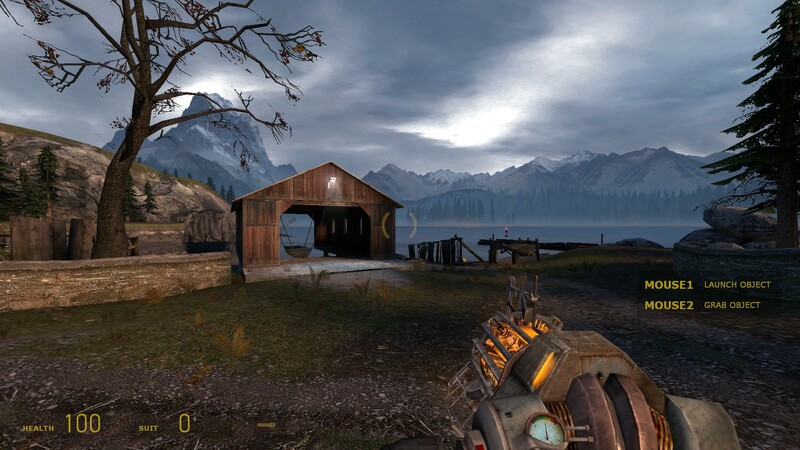 While there’s been talk of Half-Life 3 and Half-Life 2 Episode 3 sporadically in the years since I first beat Episode 2, my intuition tells me that the expectations for these two items is one of the contributing factors to why Valve is not actively pursuing a continuation of Episode 2. With this being said, Downfall isn’t quite finished yet, and it will be interesting to see as to whether or not its continuations will come out as the modder has suggested – if there are indeed to be future instalments of Downfall, I will definitely be interested in seeing where things are headed.